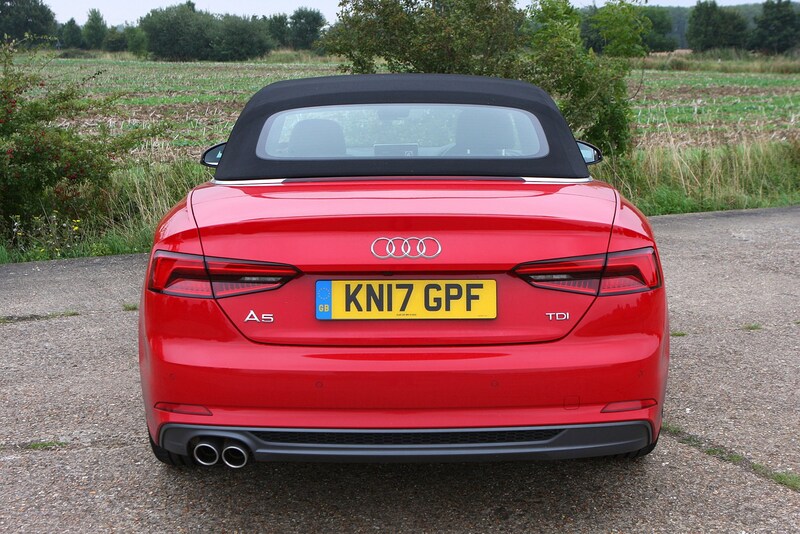 There are four specifications levels on offer here. 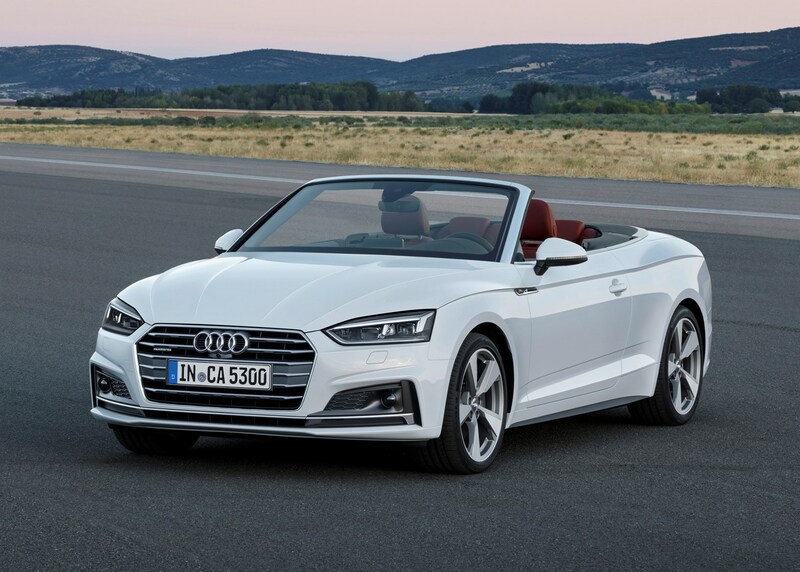 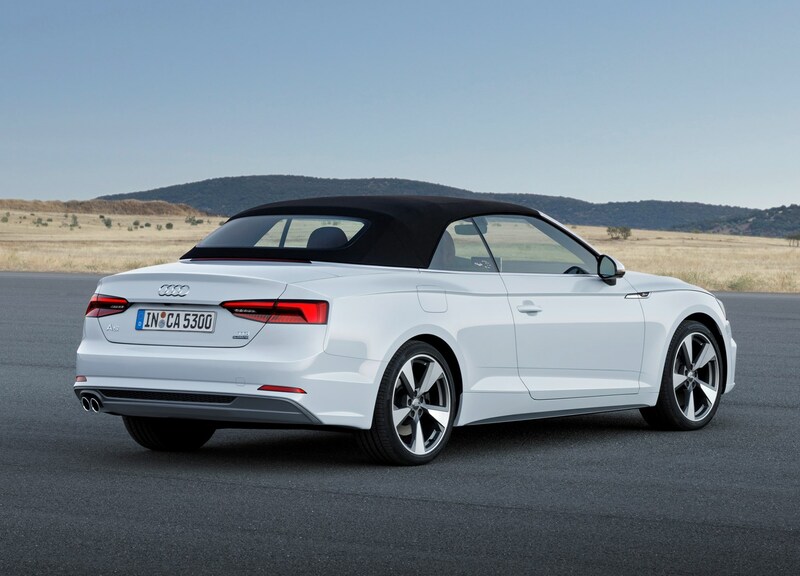 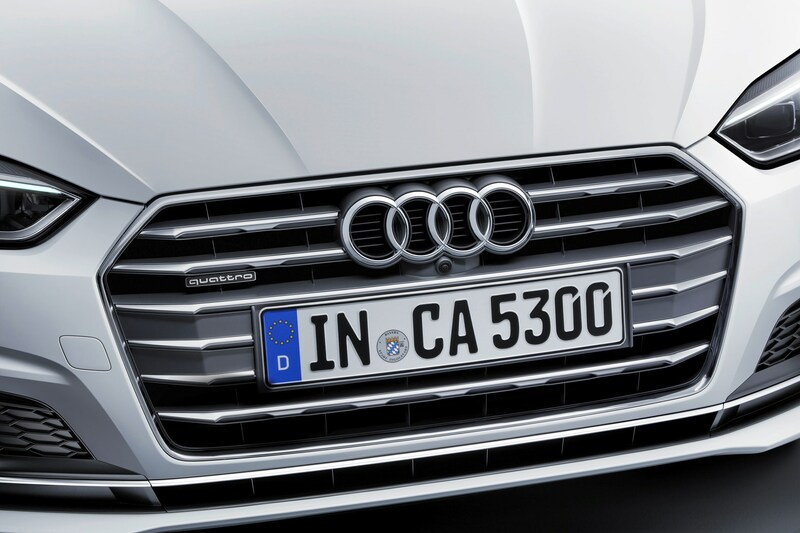 The A5 Cabriolet is available in SE, Sport and S Line, while the higher-performance S5 sits atop the tree for now. 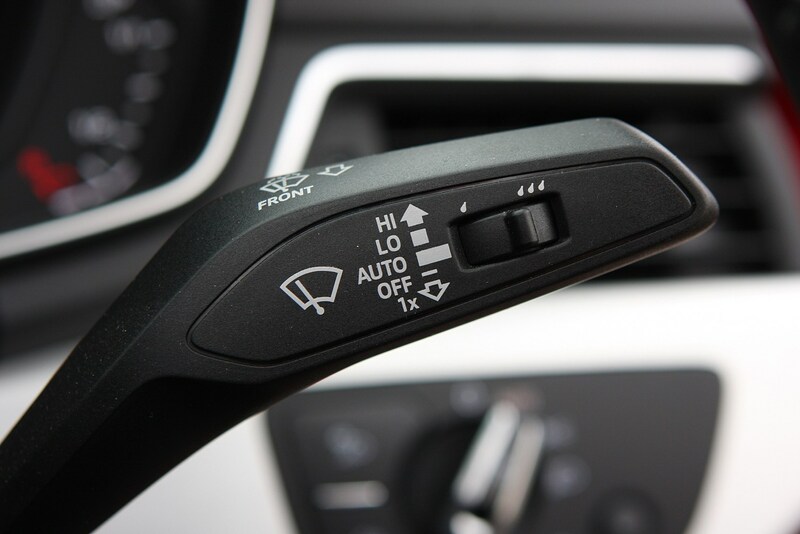 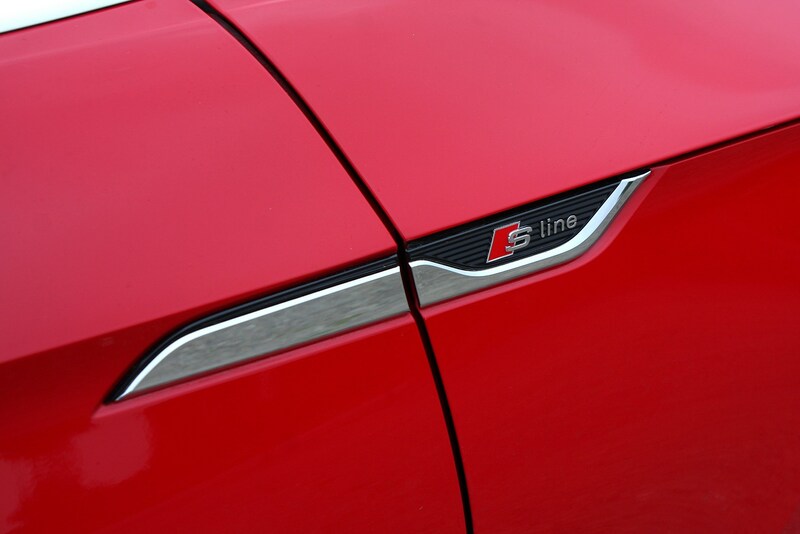 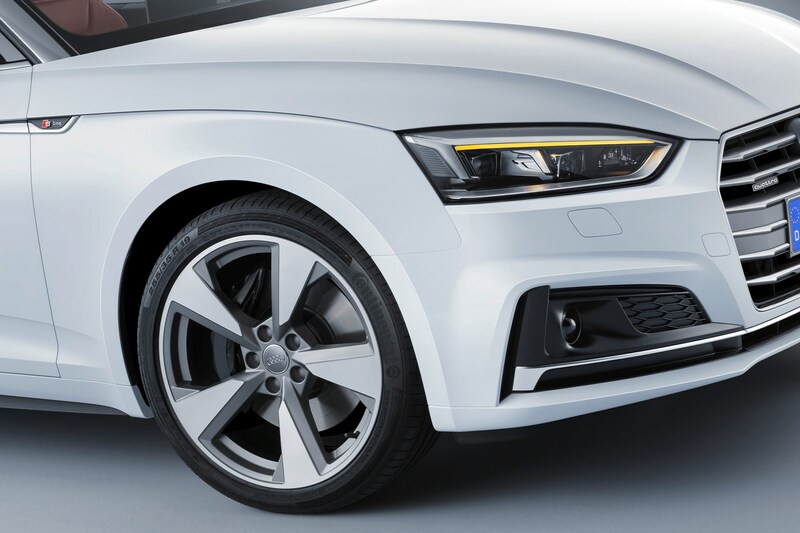 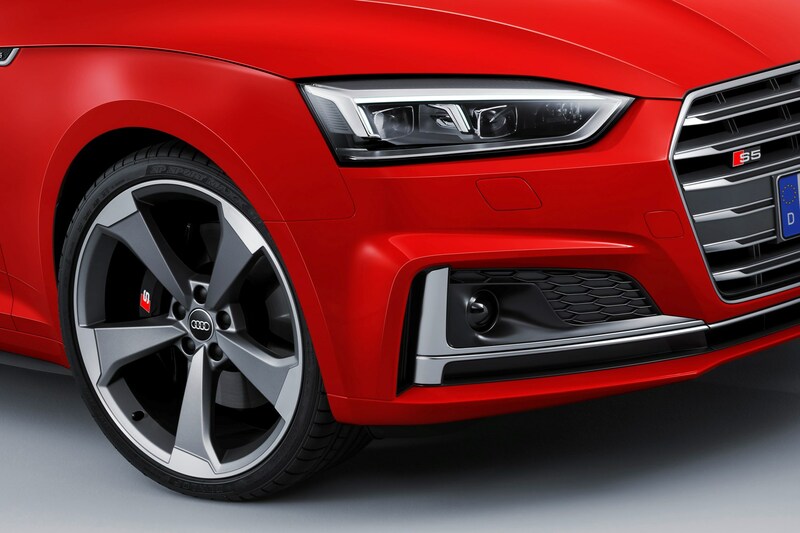 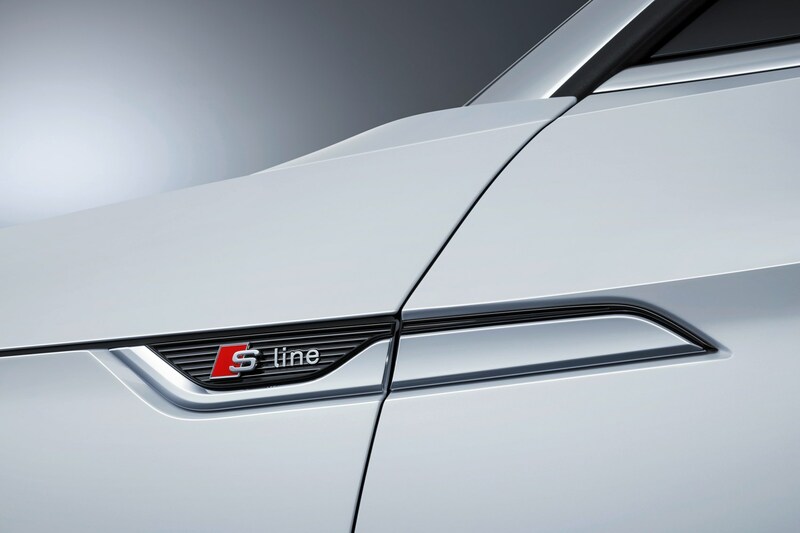 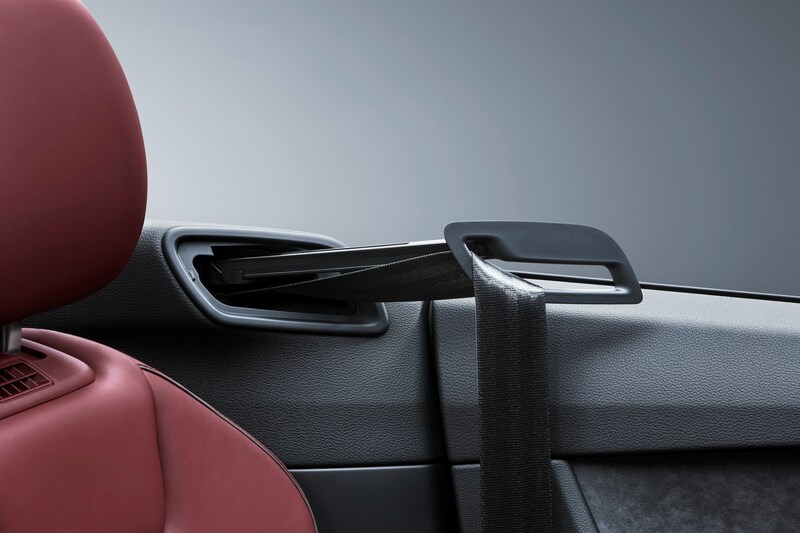 While lower trims are a little parsimonious in their offerings, there’s a huge range of options to personalise and upgrade your car. 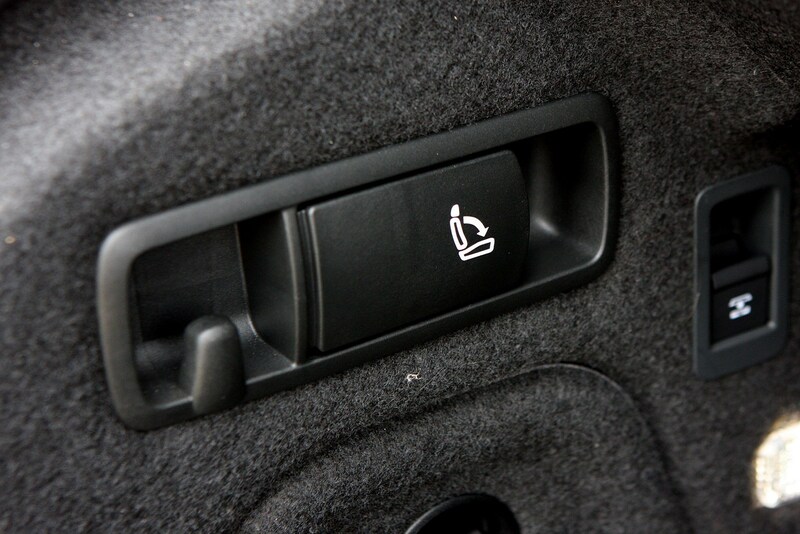 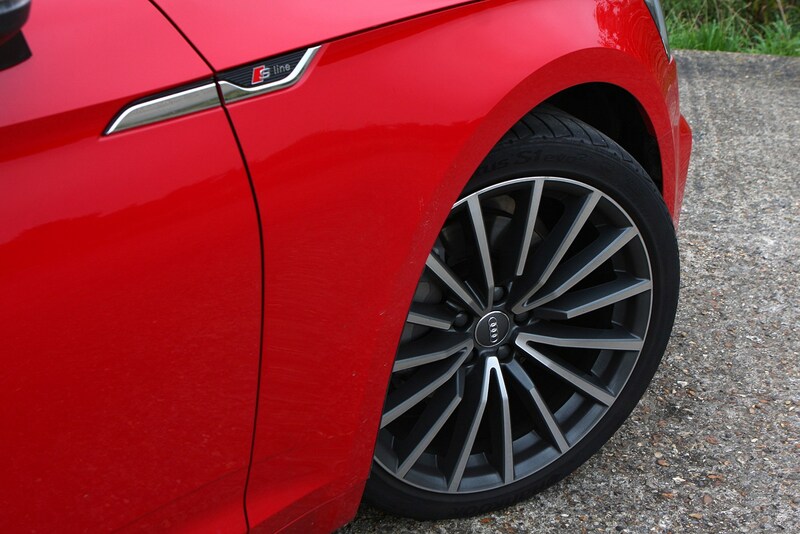 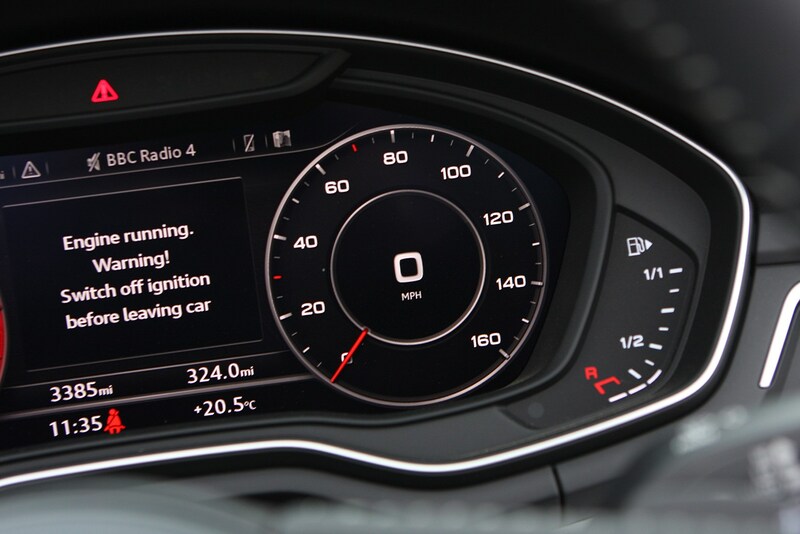 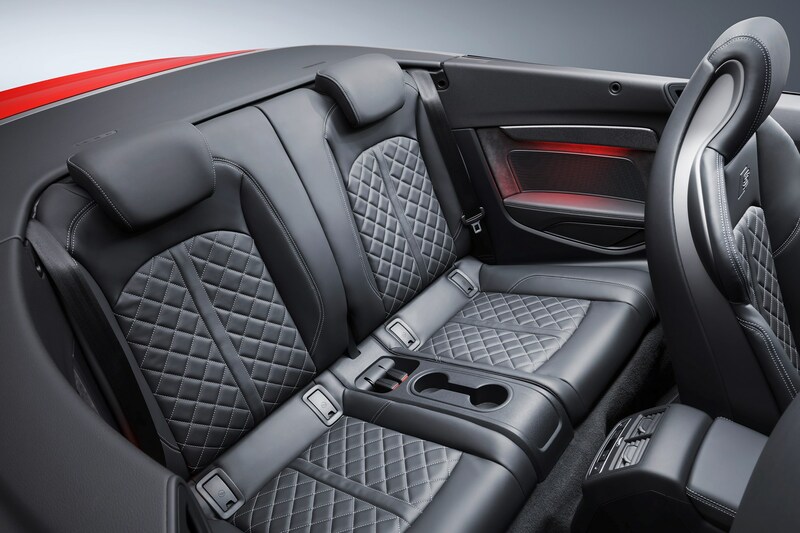 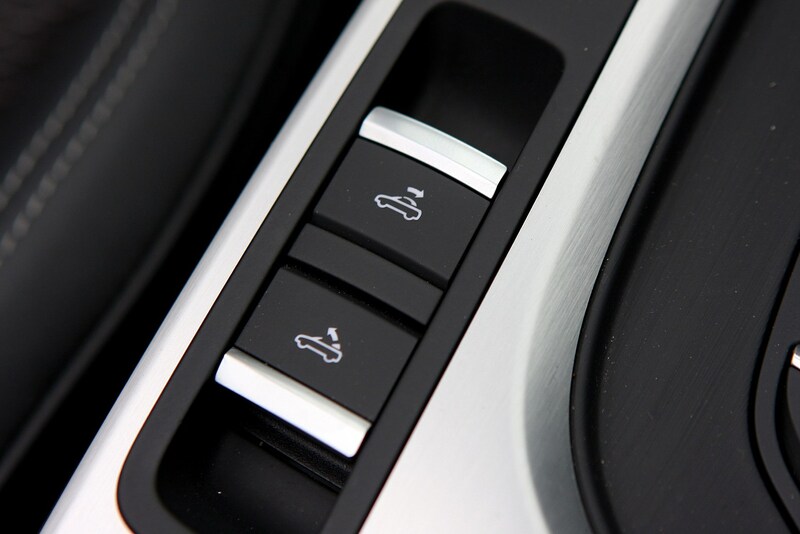 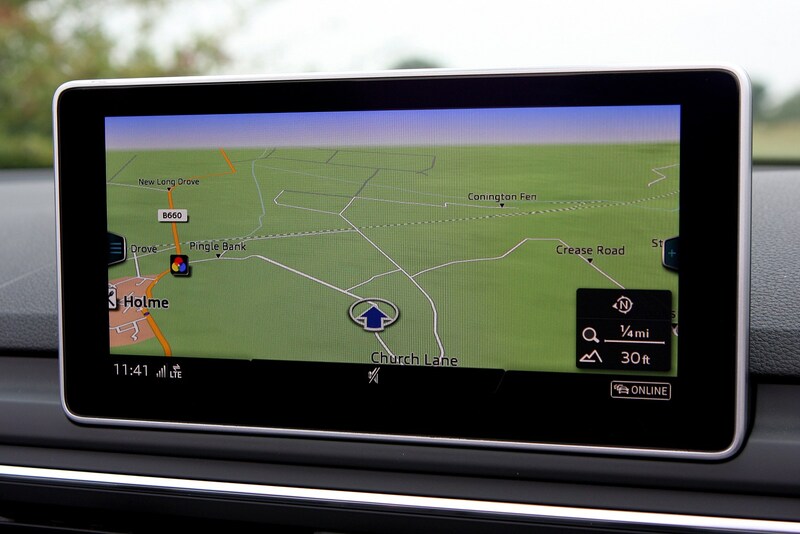 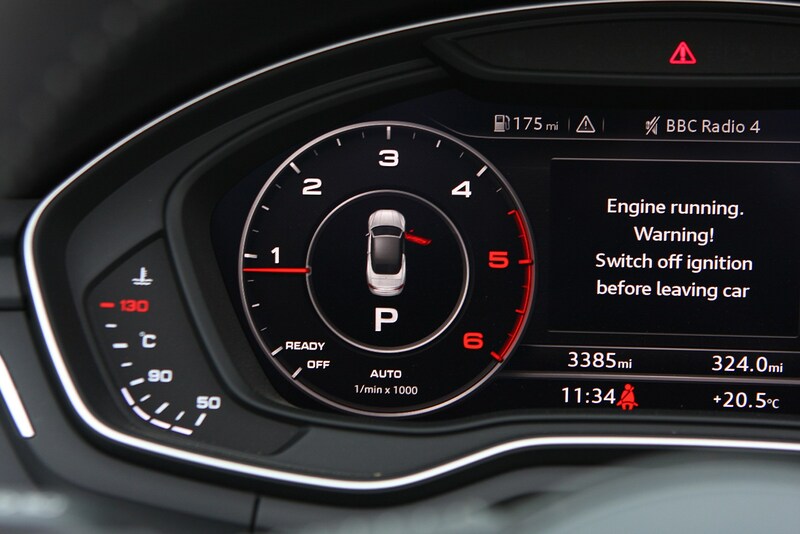 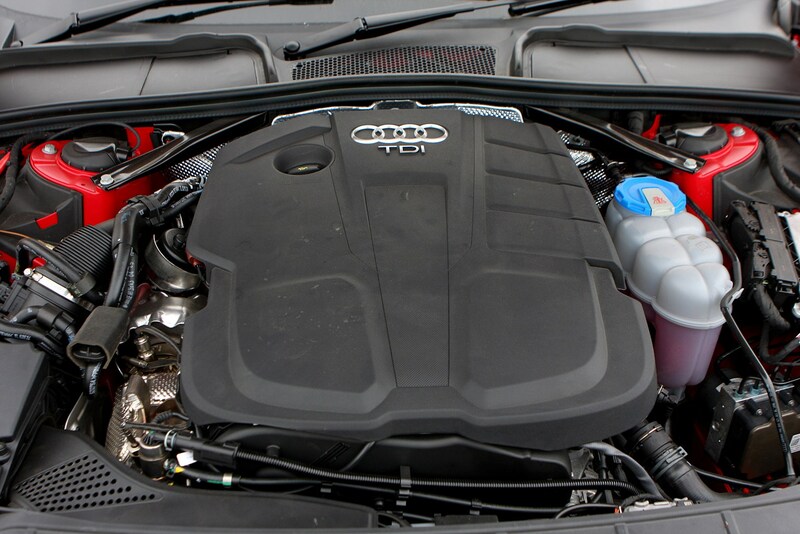 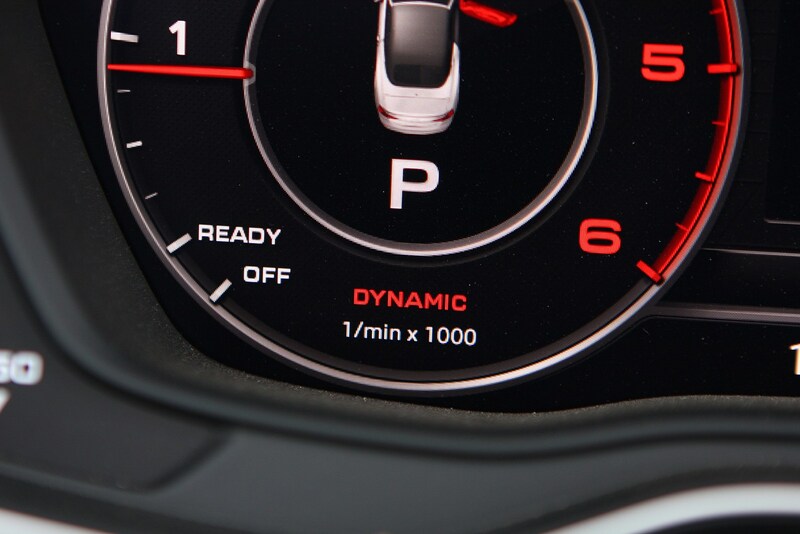 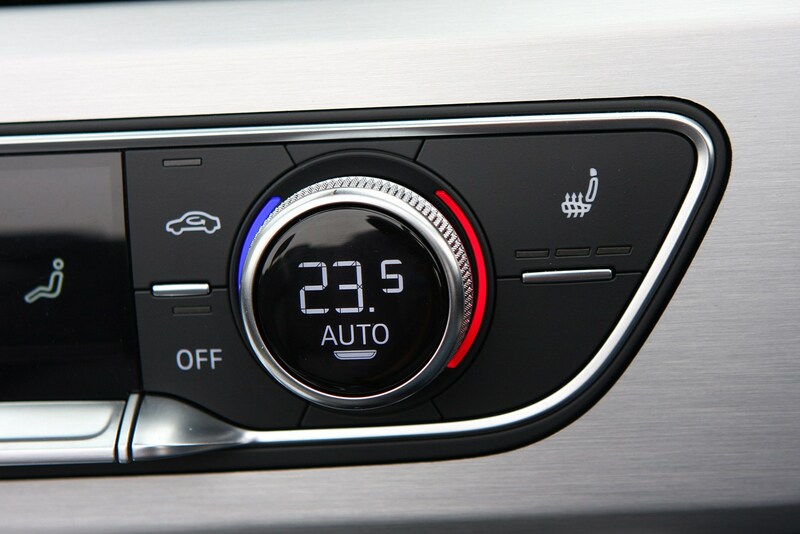 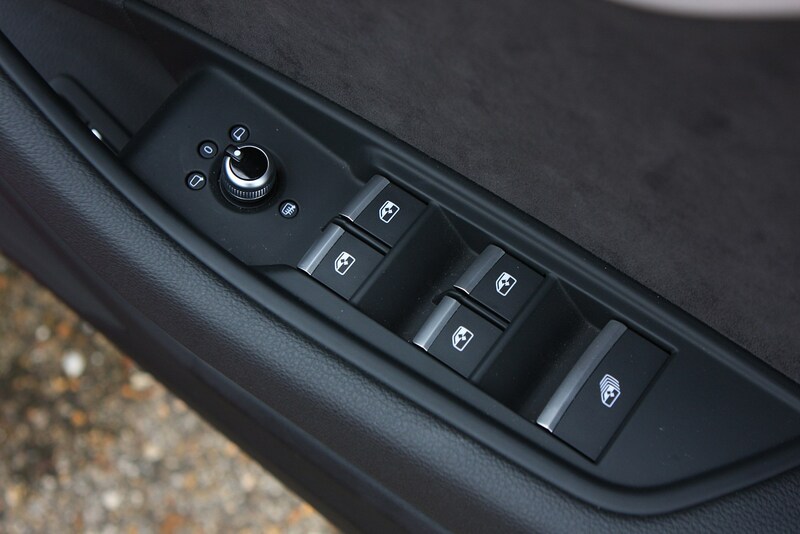 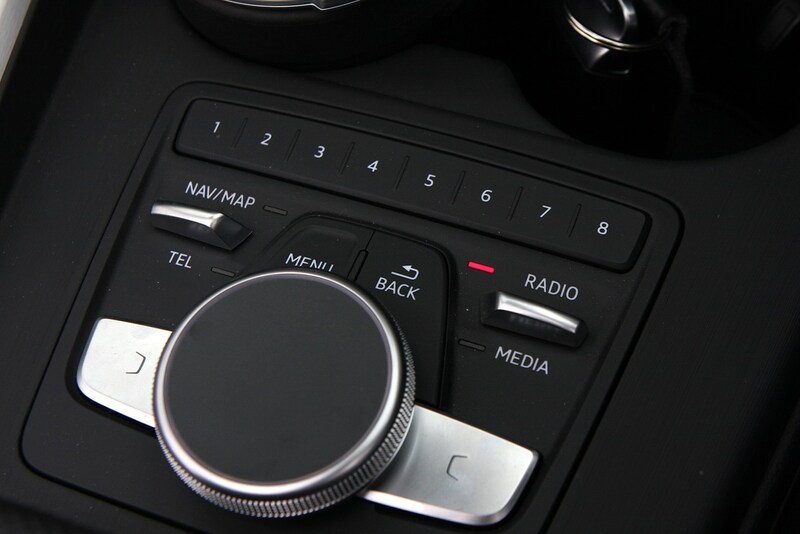 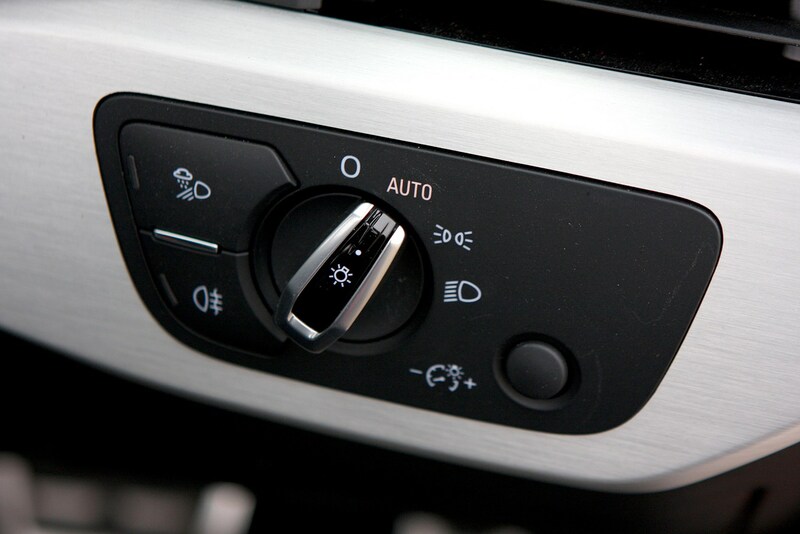 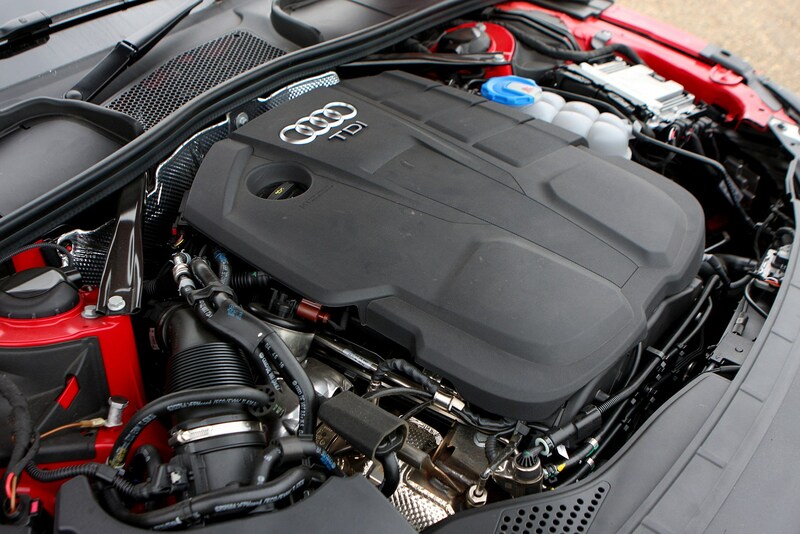 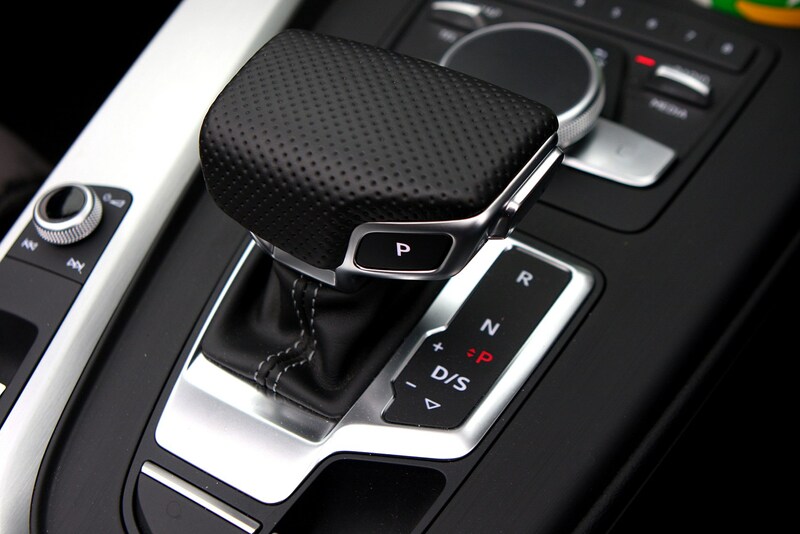 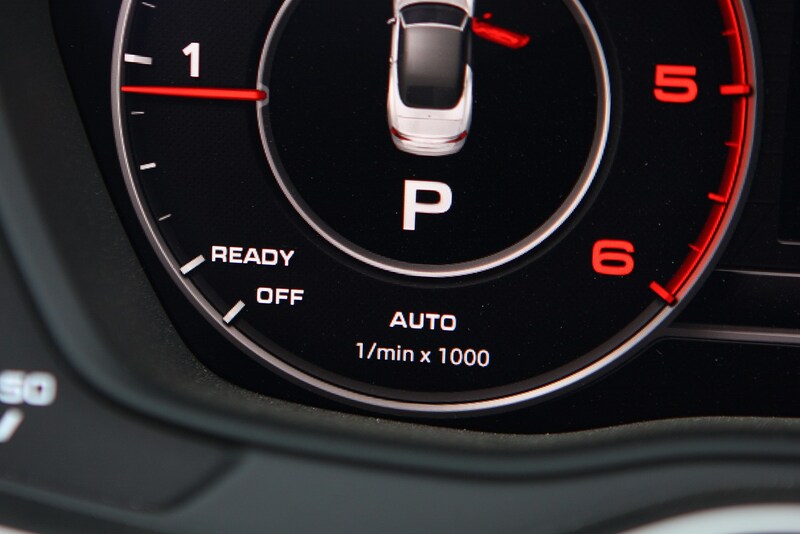 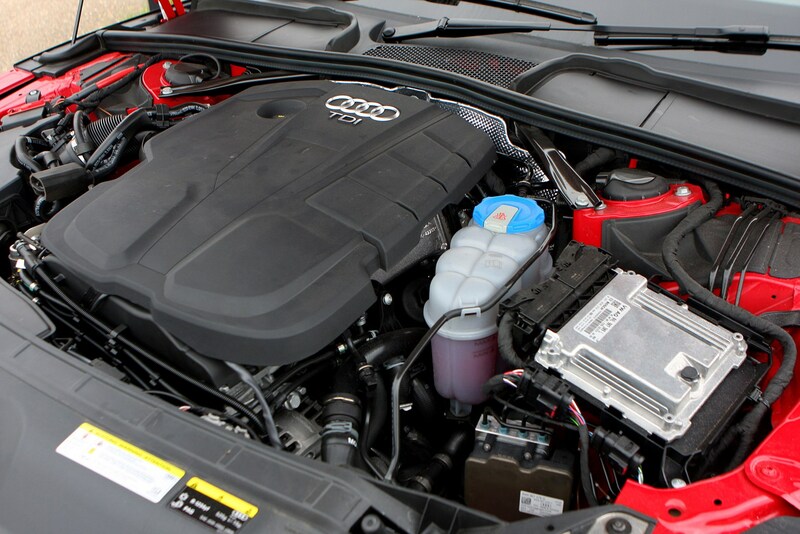 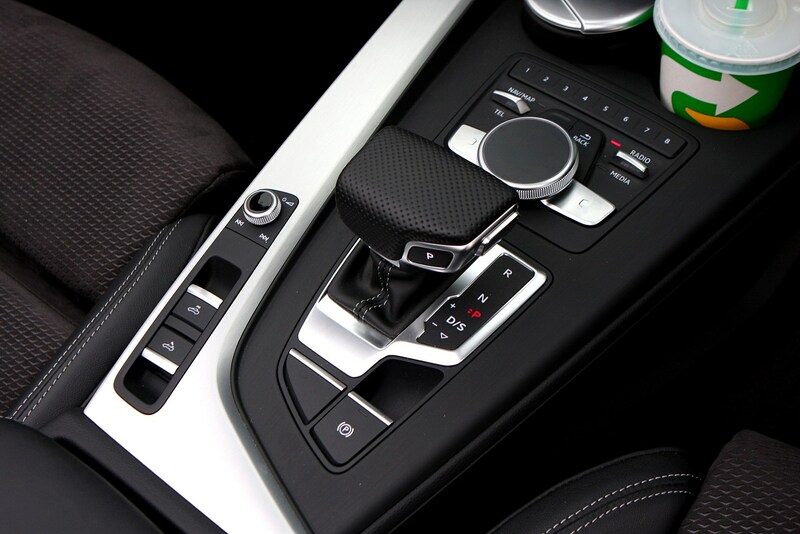 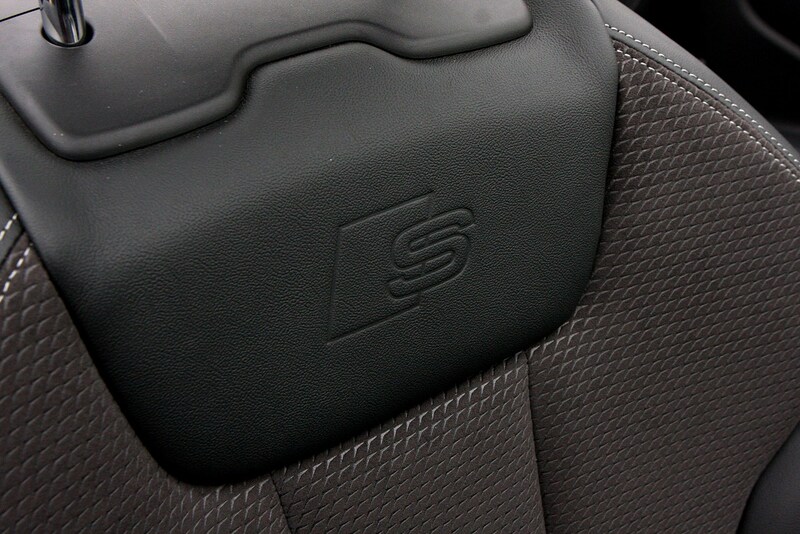 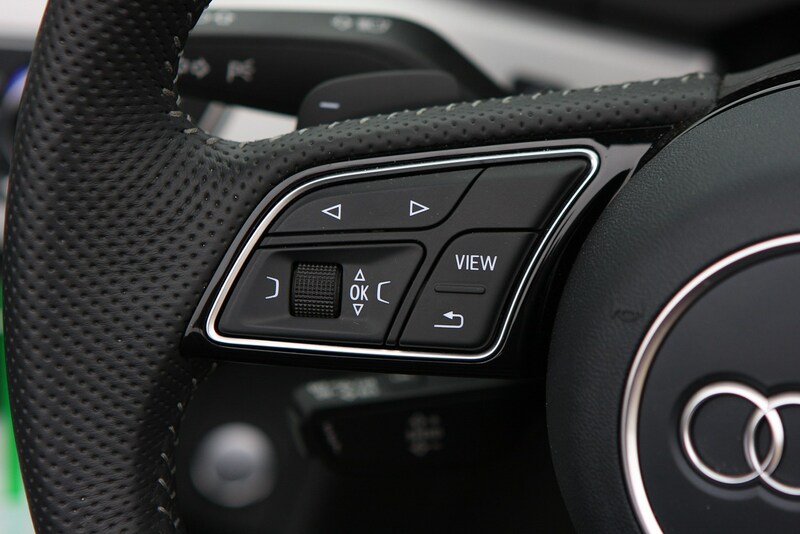 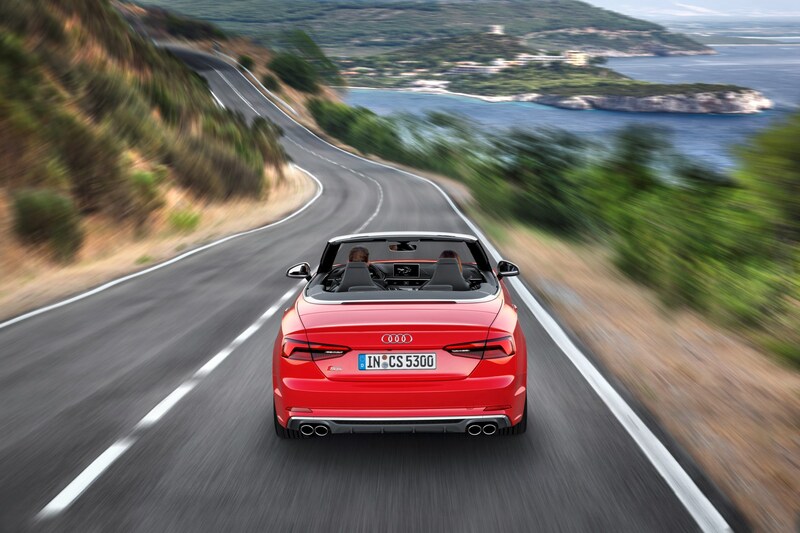 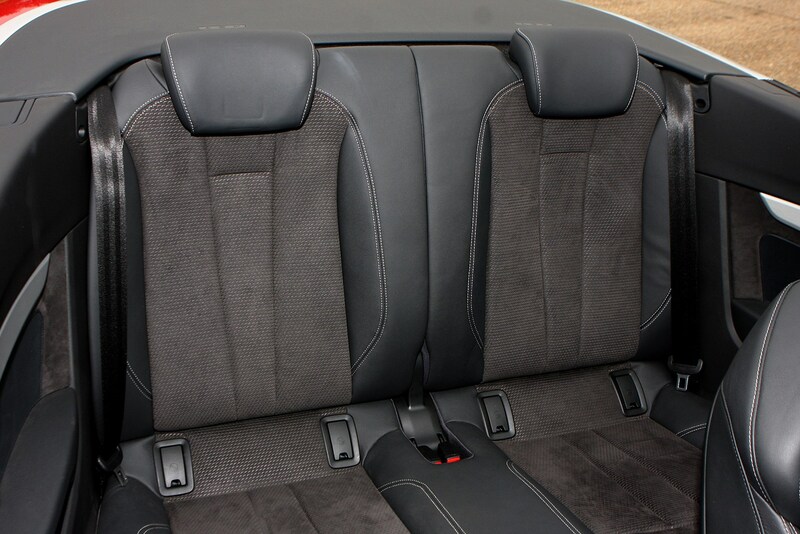 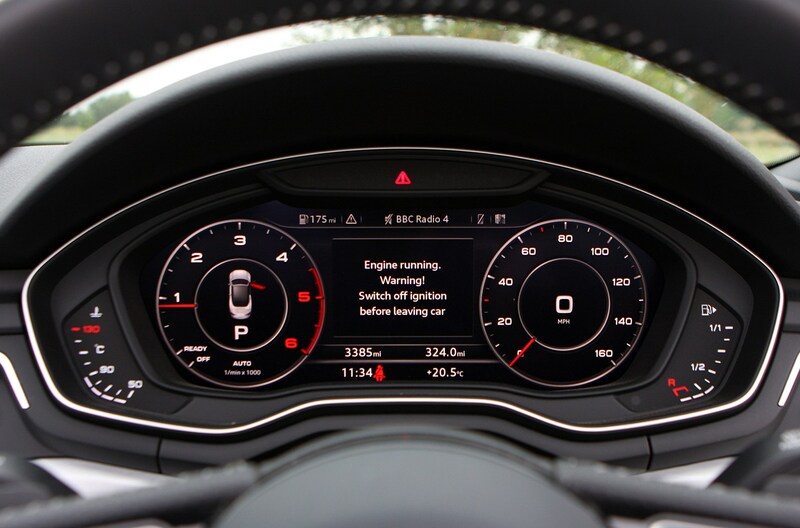 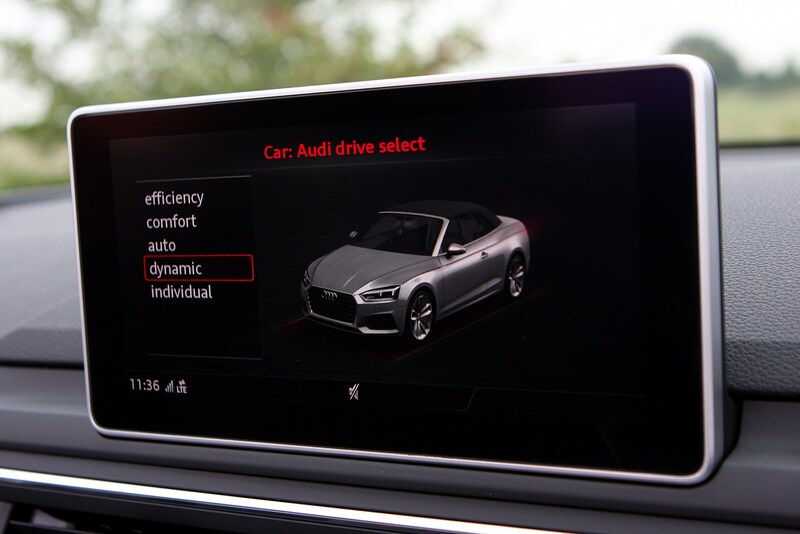 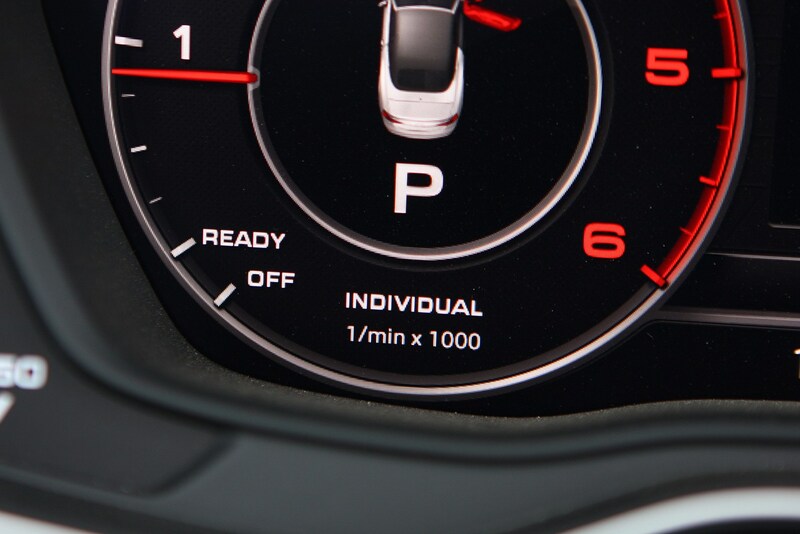 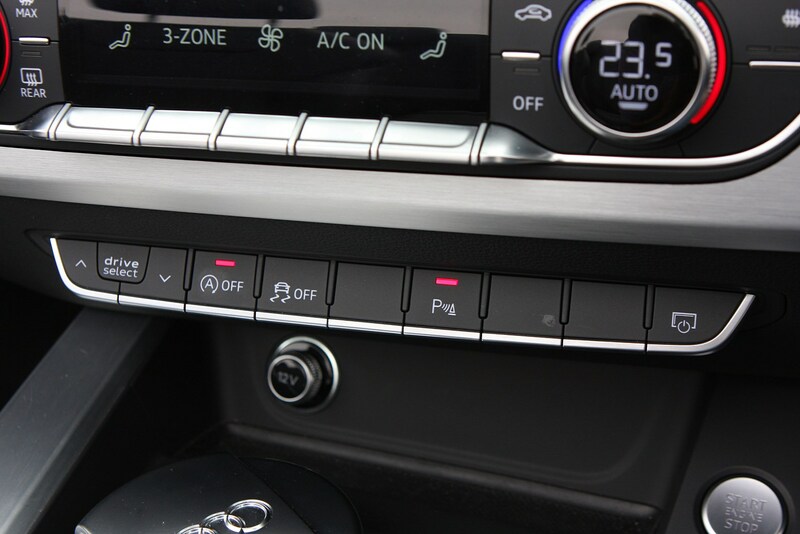 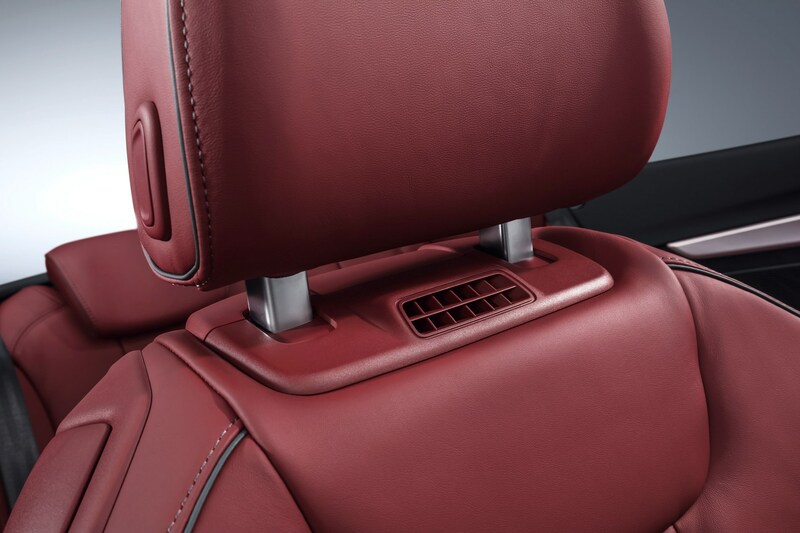 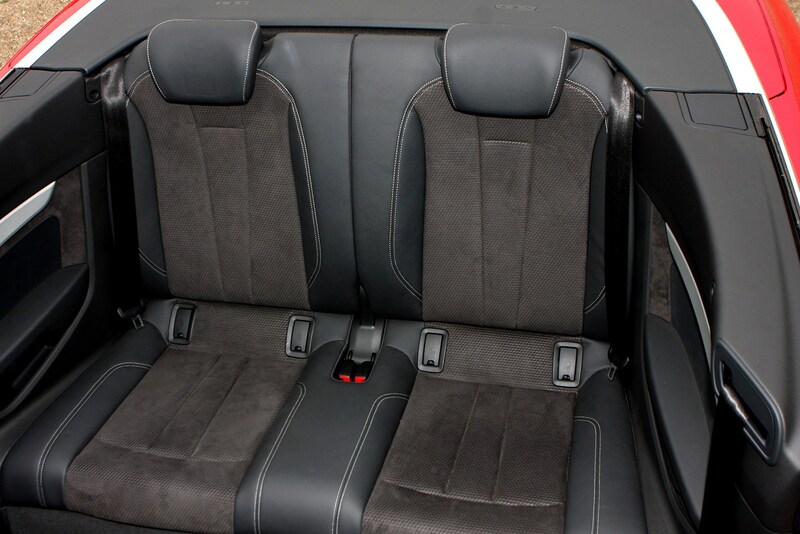 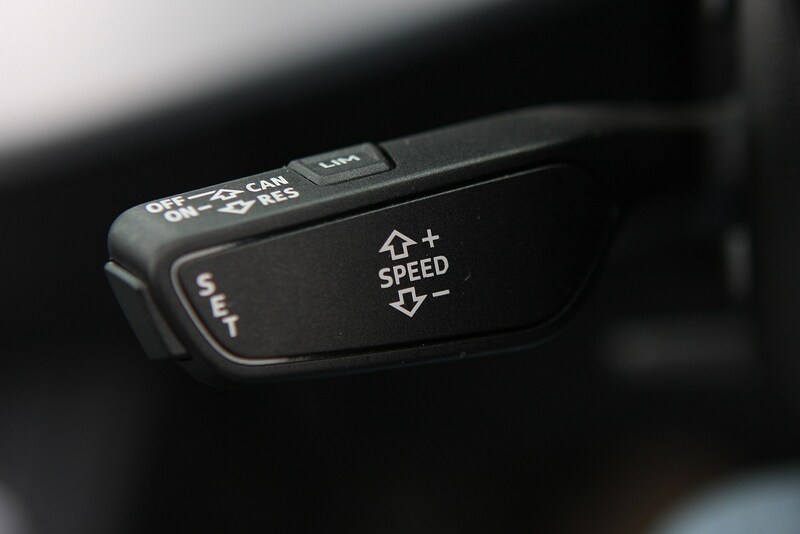 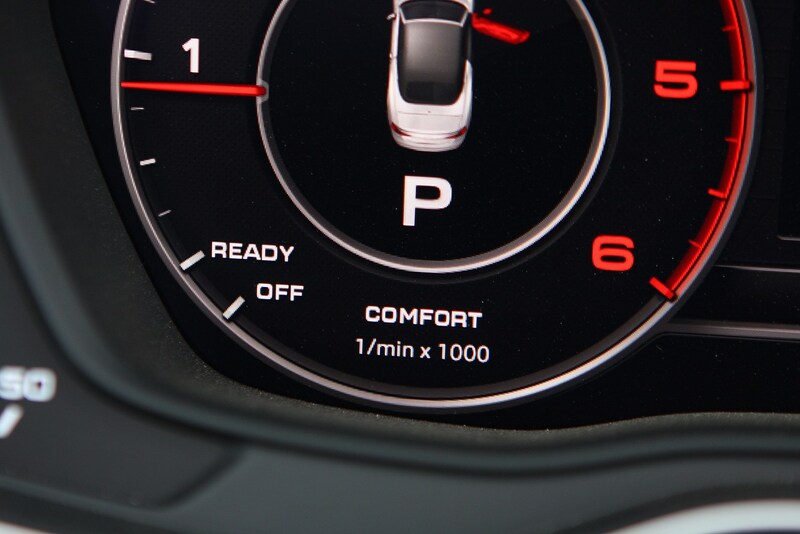 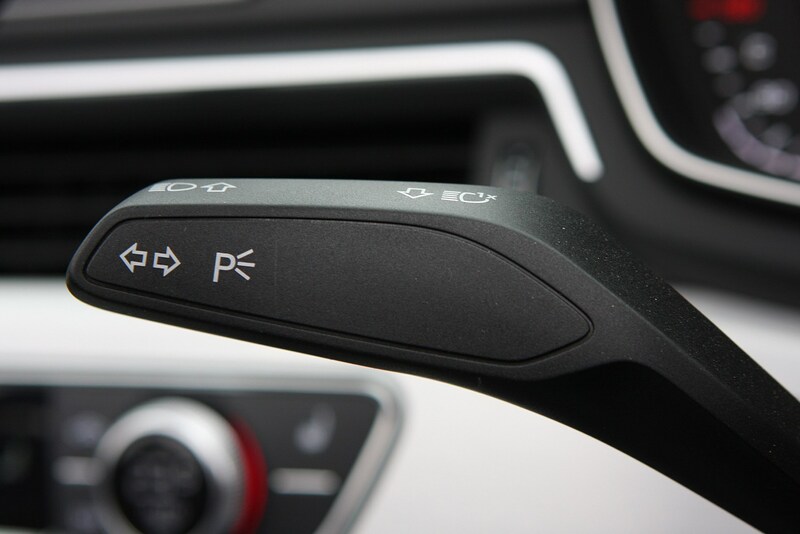 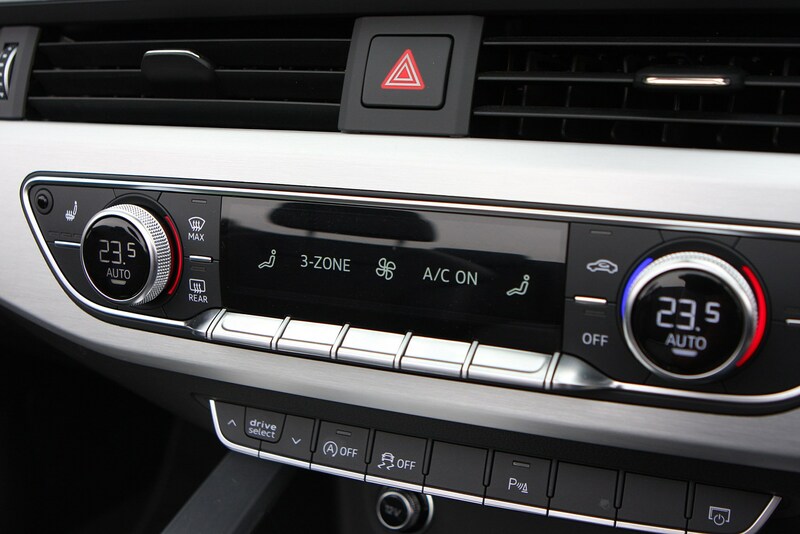 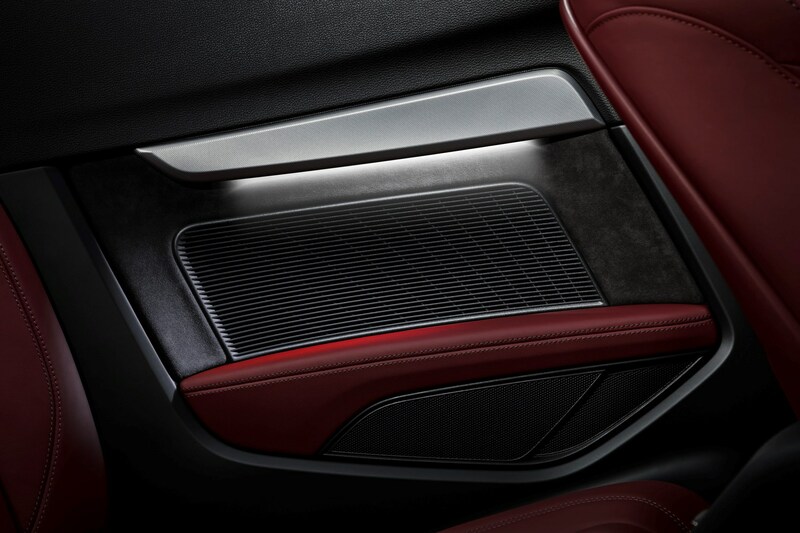 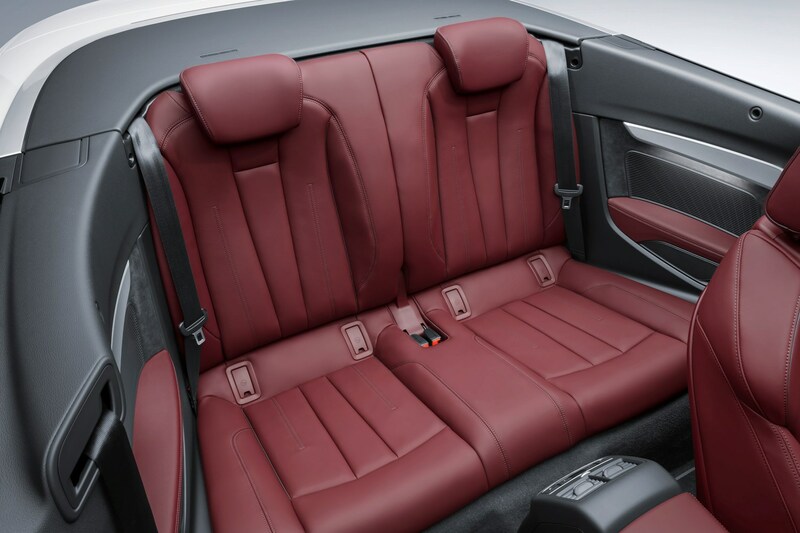 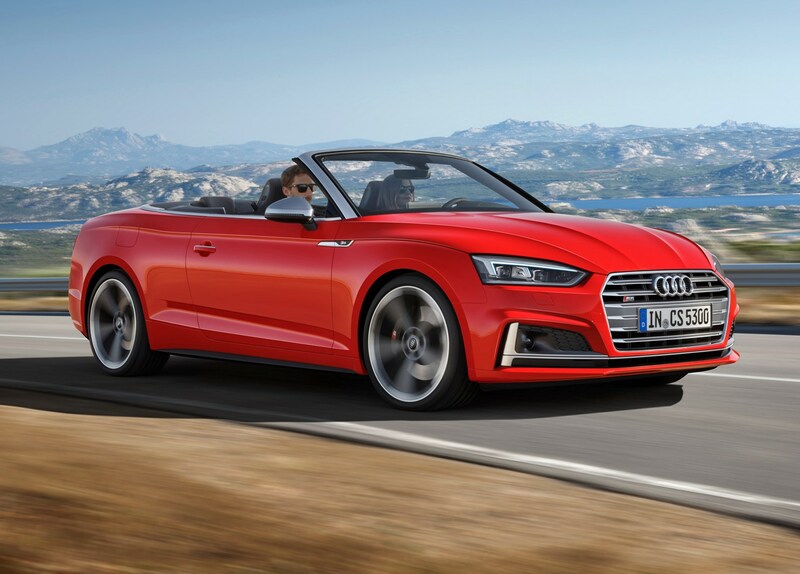 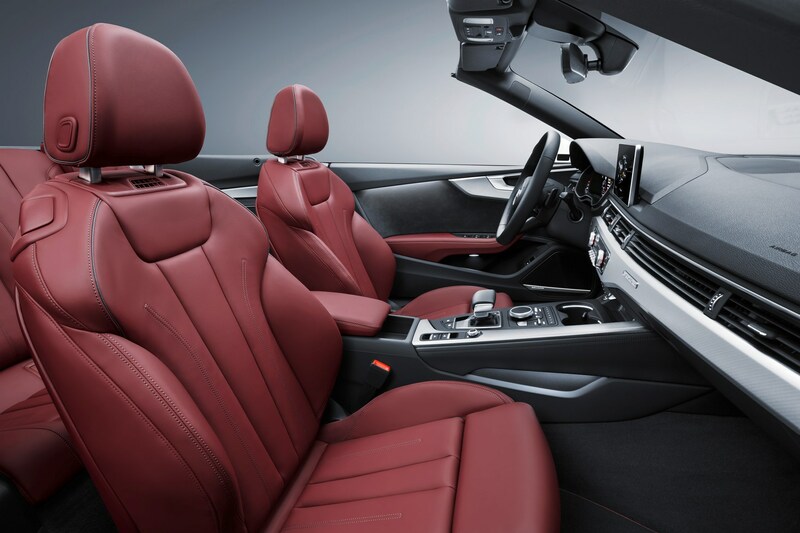 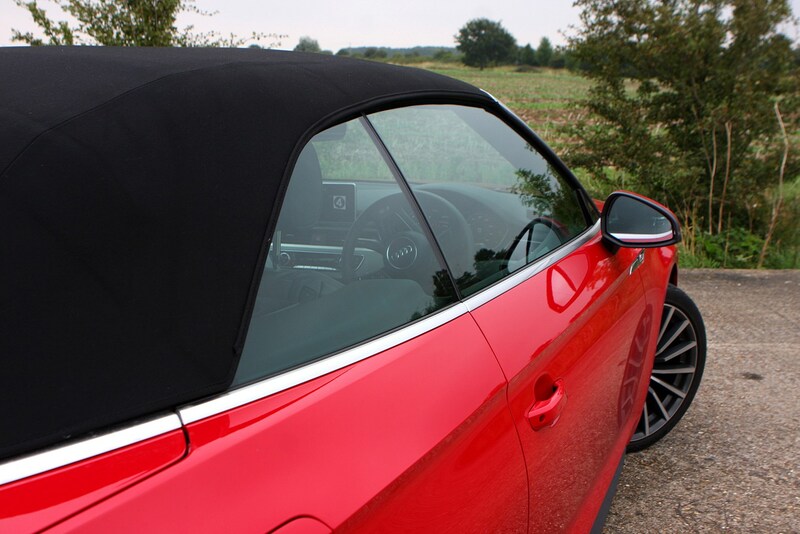 The basic equipment list includes equipment that is standard across all versions of the Audi A5 Cabriolet. 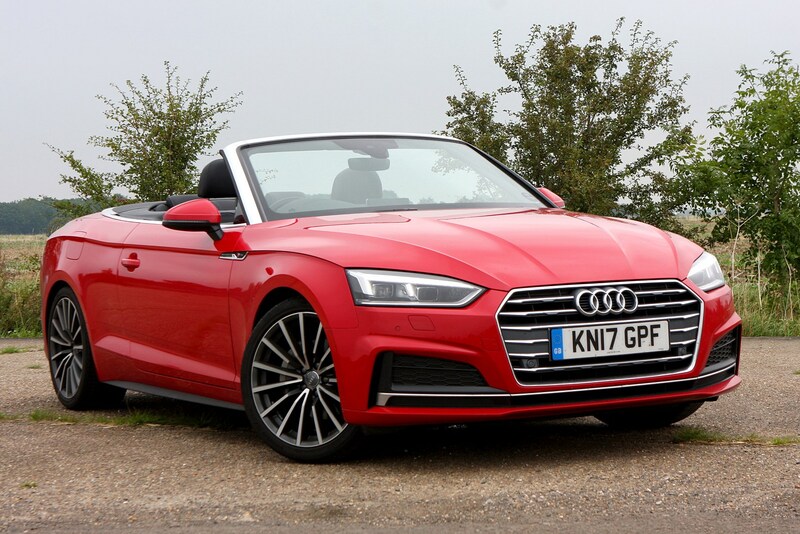 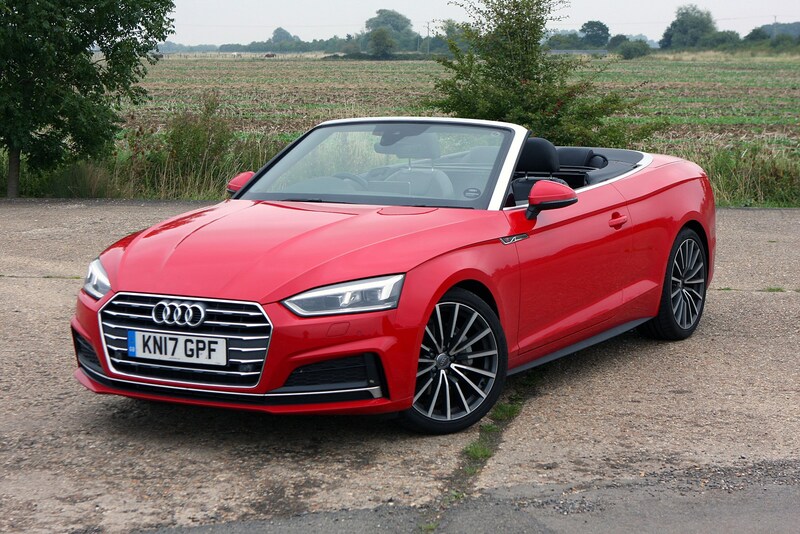 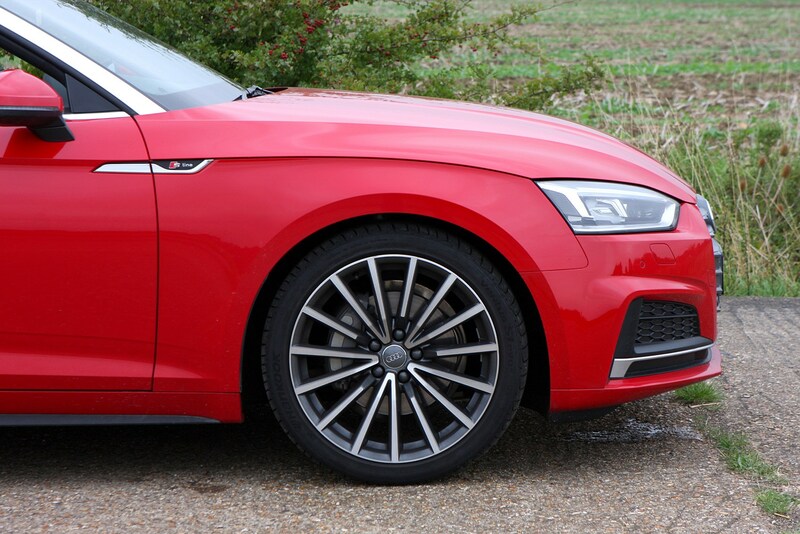 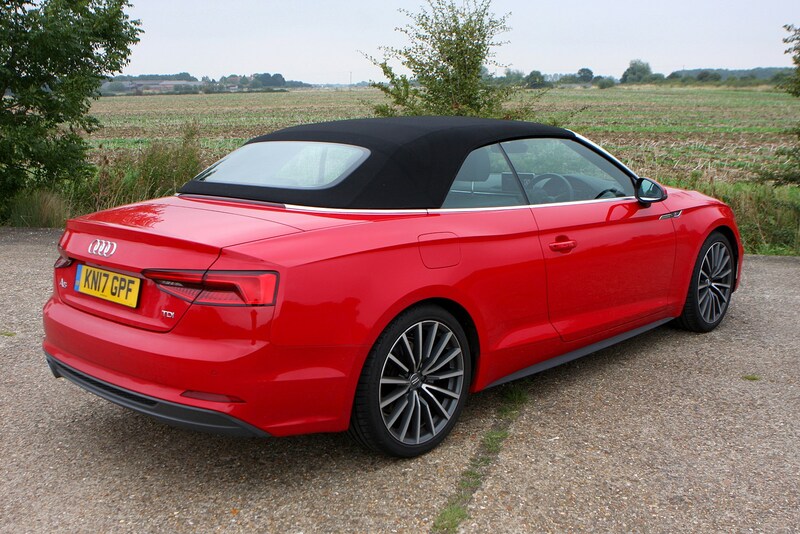 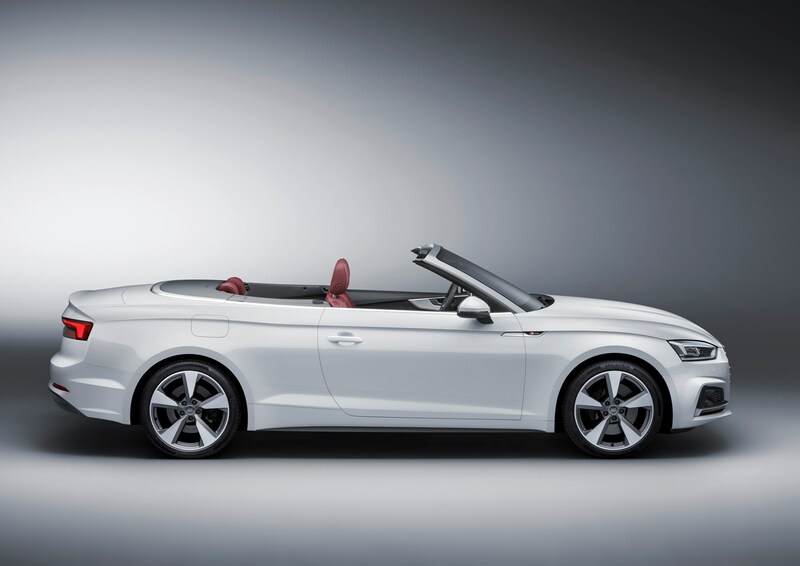 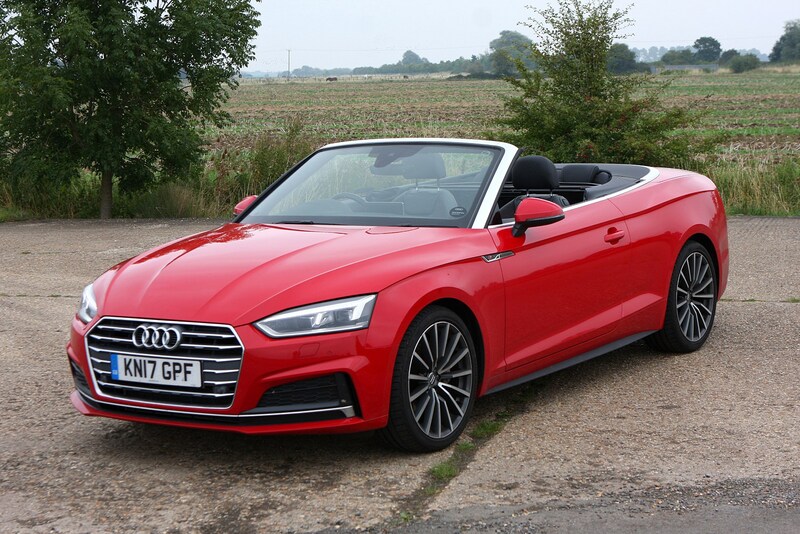 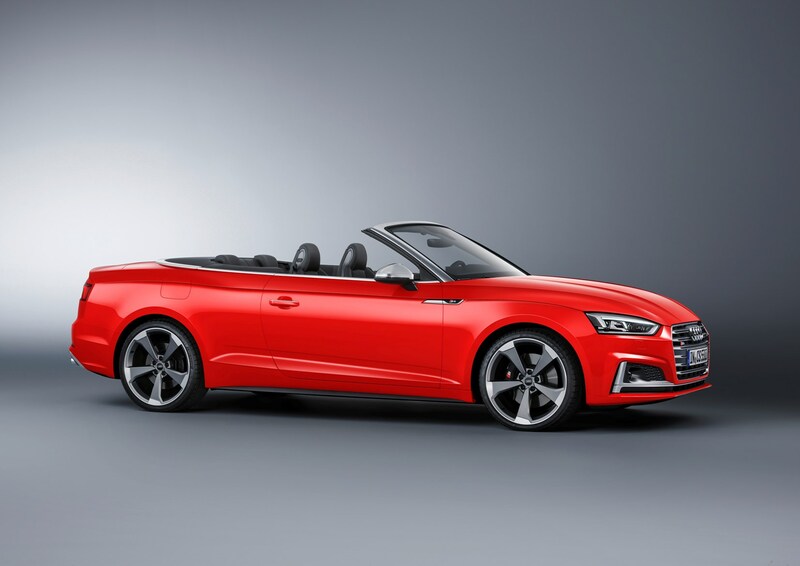 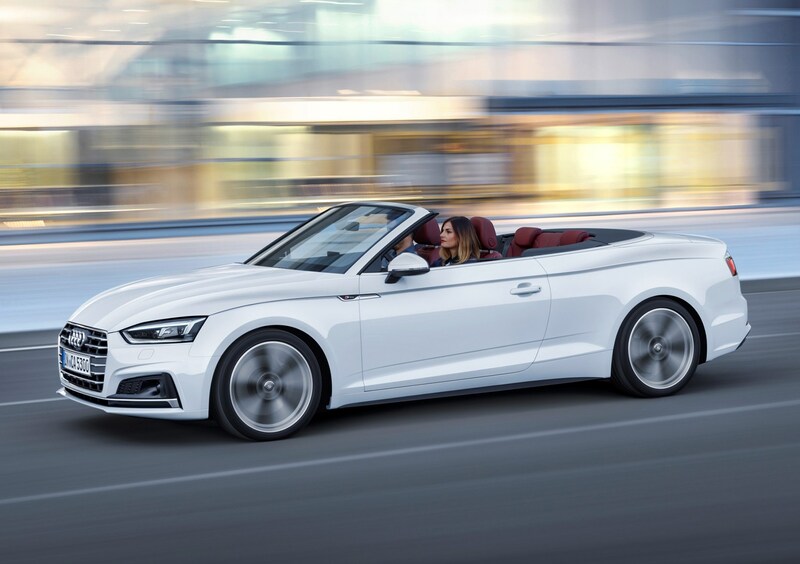 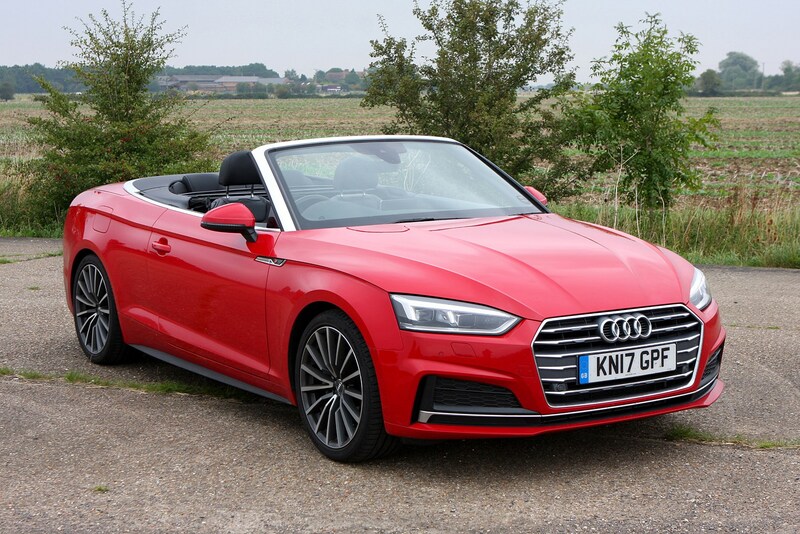 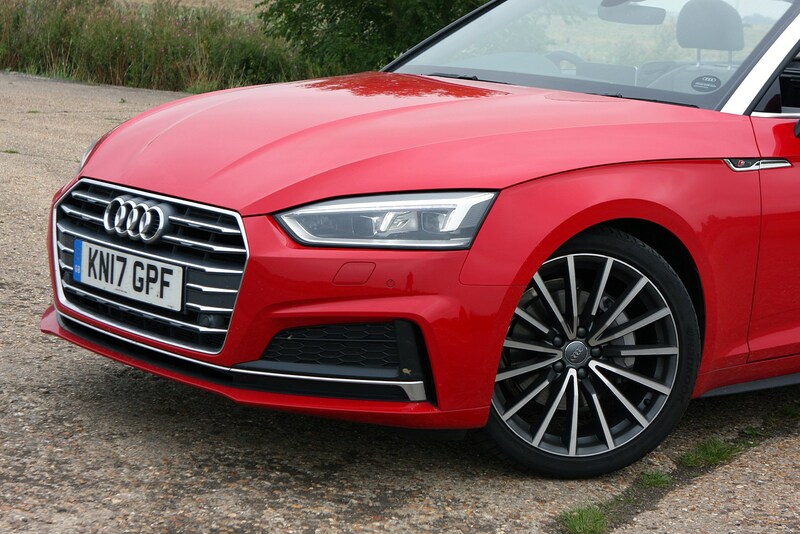 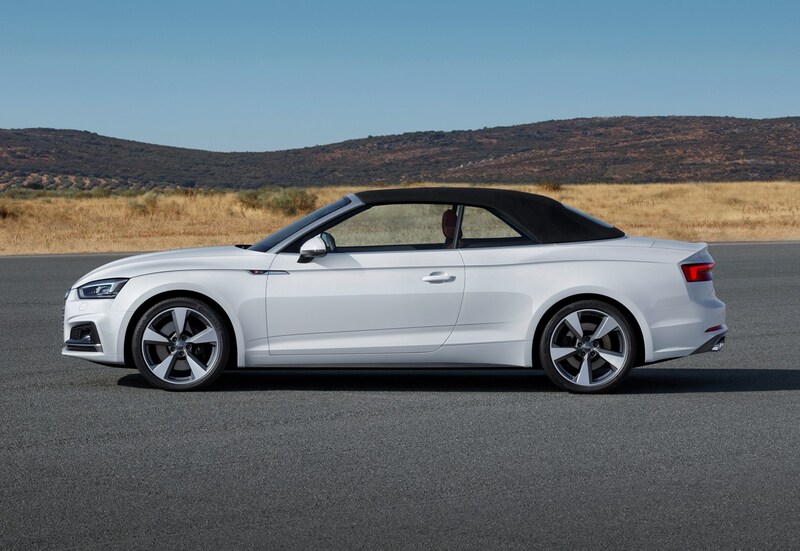 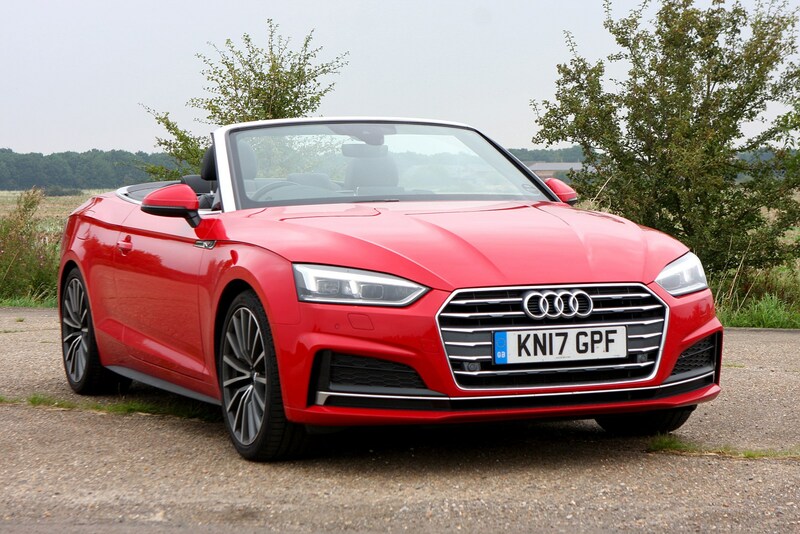 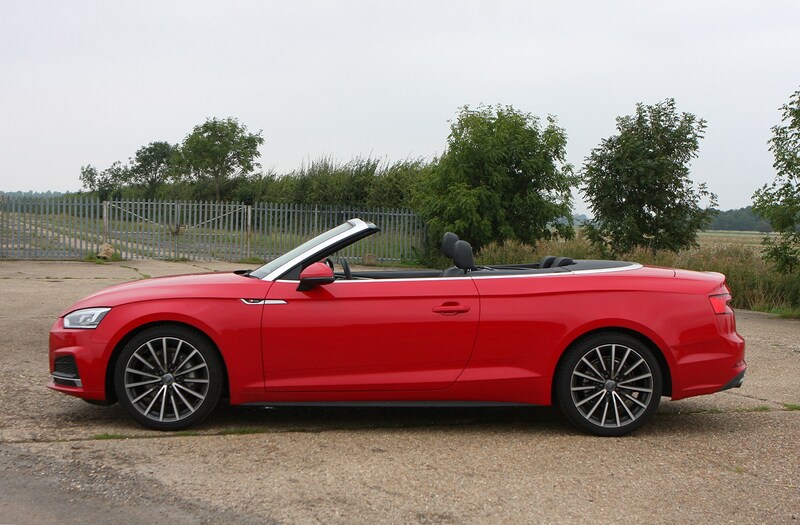 A stiff body shell and a range of airbags around the cabin mean that fundamentally the Audi A5 Cabriolet is a safe car. 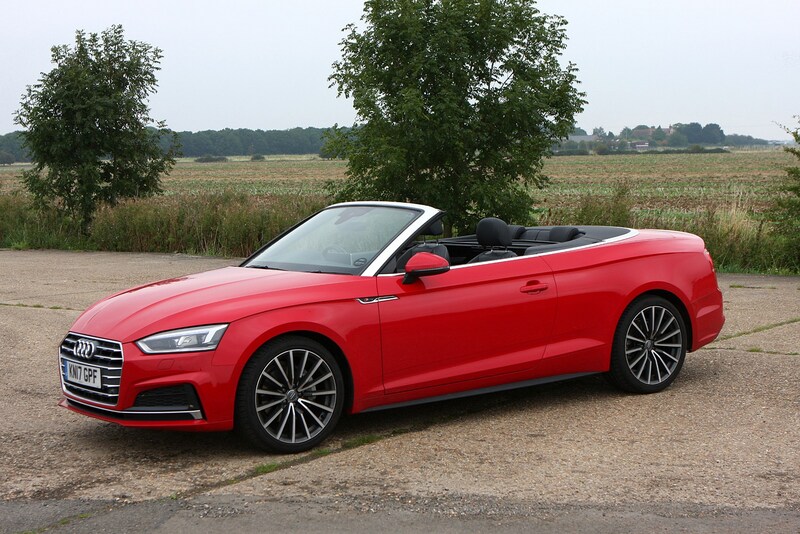 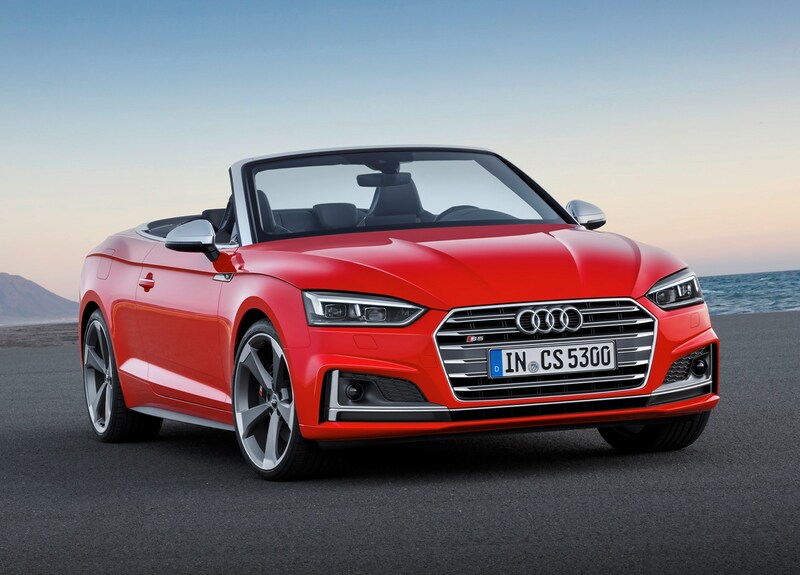 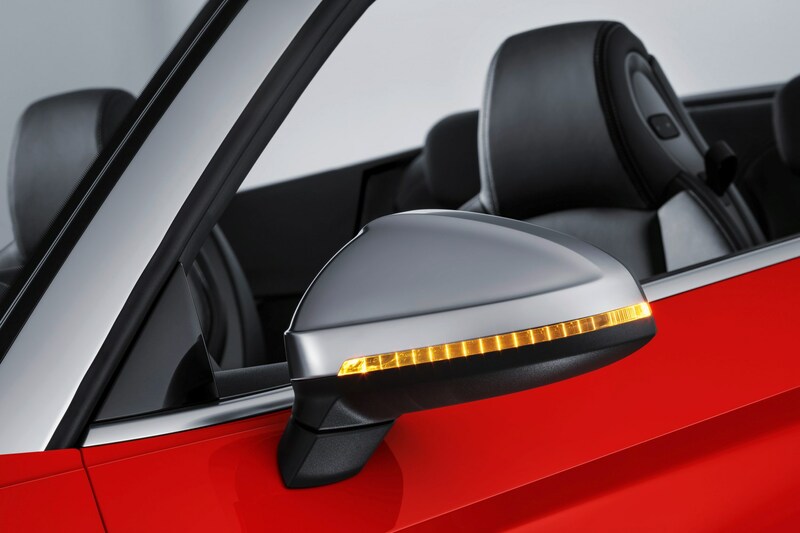 While it shares many parts with the A4 Saloon and A5 Coupe, Euro NCAP has specified the five-star rating awarded to them does not apply to the Cabriolet, due to its heavier weight. 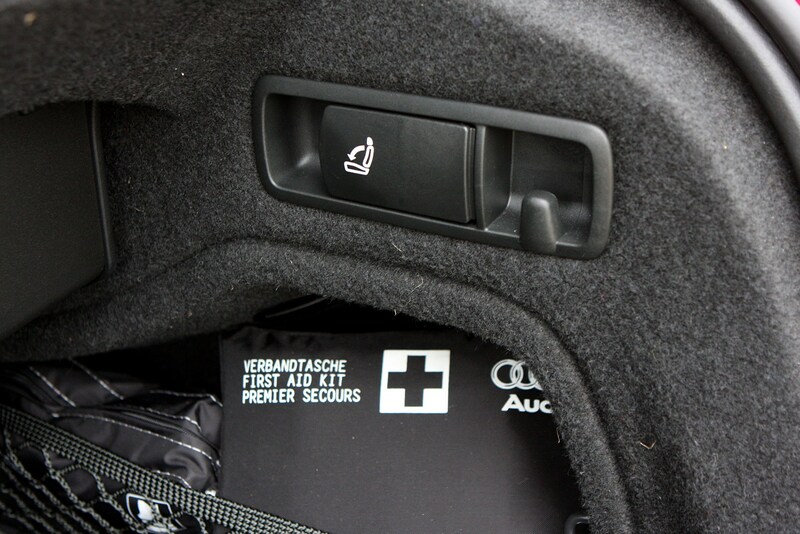 It hasn’t been tested yet. 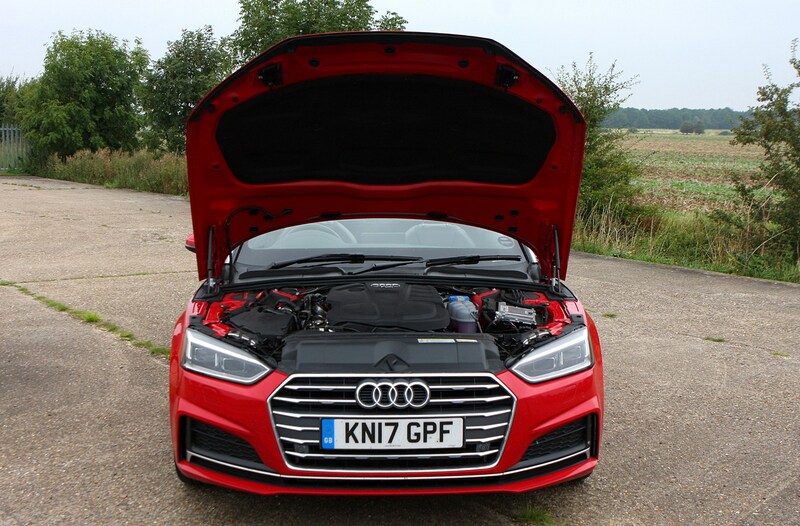 Expect it to perform in a similar way, though. 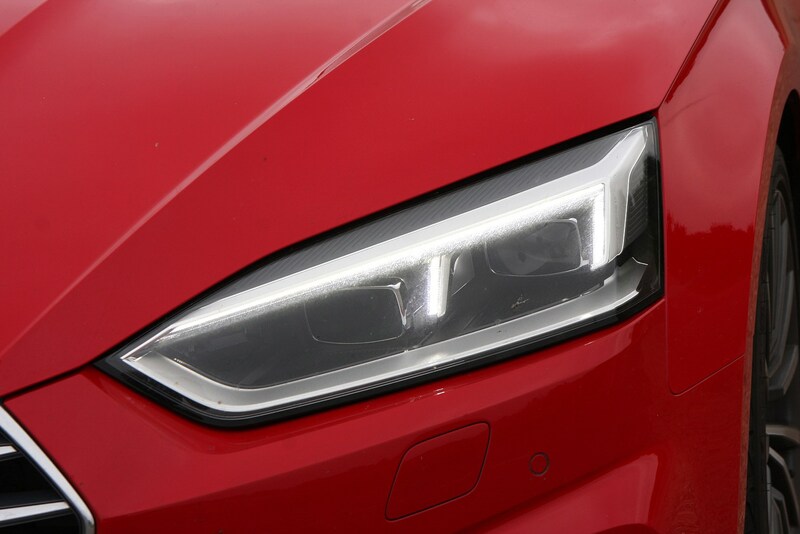 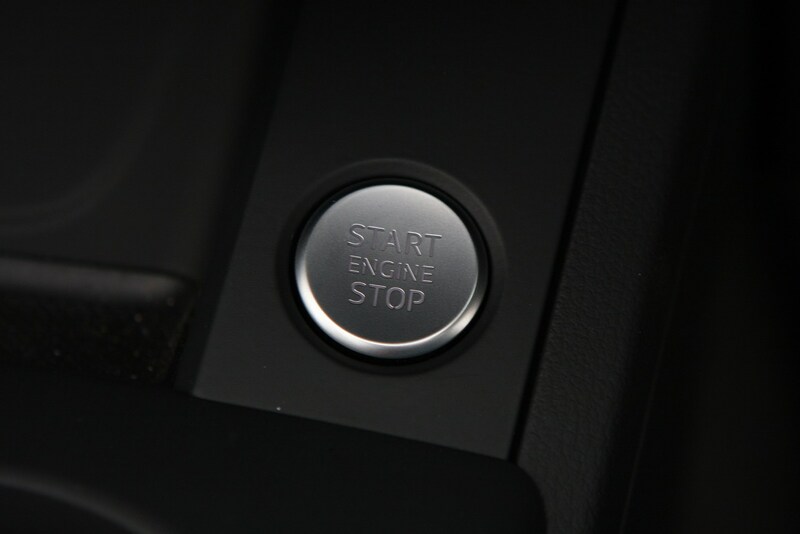 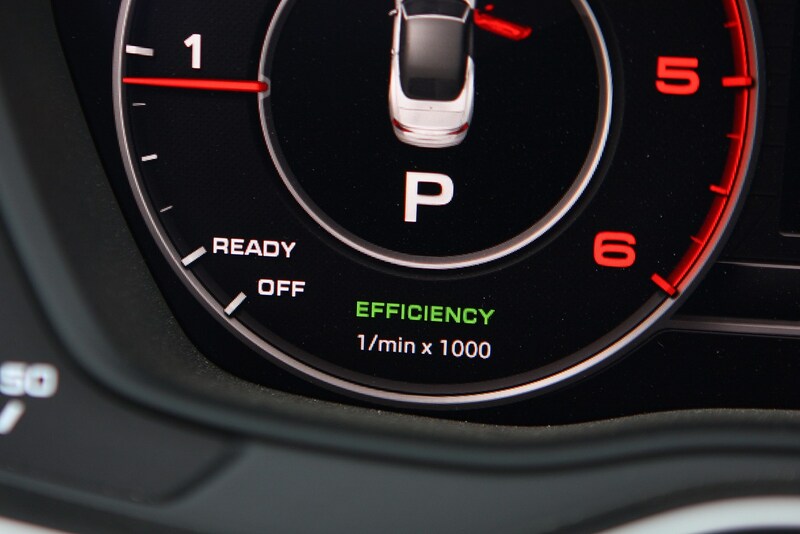 As standard you get an automatic parking system and autonomous emergency braking along with cruise control and xenon headlights with LED daytime running lamps. 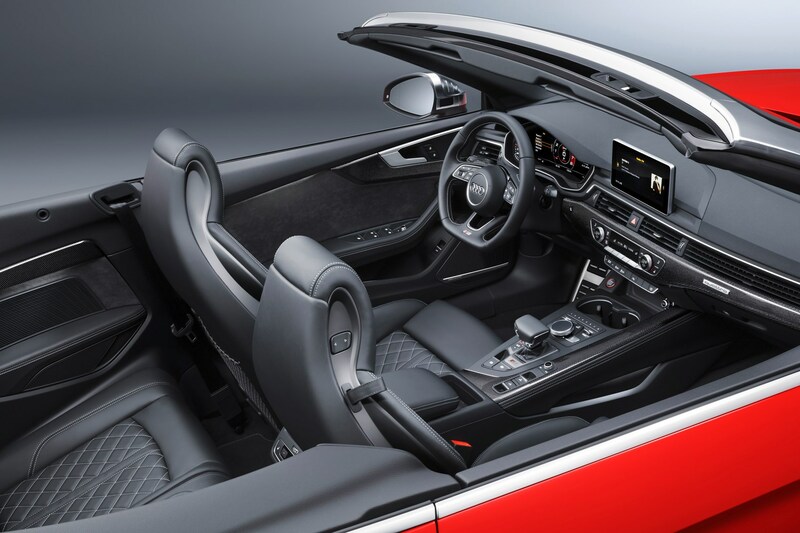 The main thing to note here is the roof takes 15 seconds to open, 18 seconds to close and can operate at speeds up to 31mph; all with one touch of the button located on the central console between driver and front passenger seats. 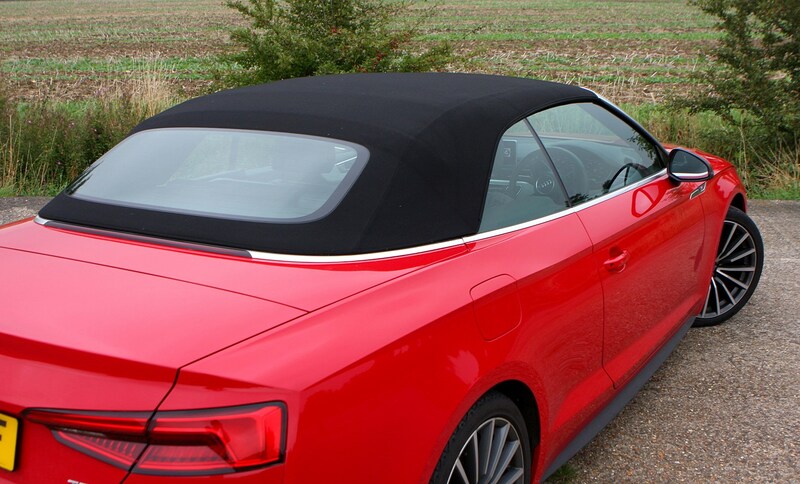 This makes it an incredibly versatile machine – you can raise or lower the roof pulling up to traffic lights if you’re caught short in a squall. 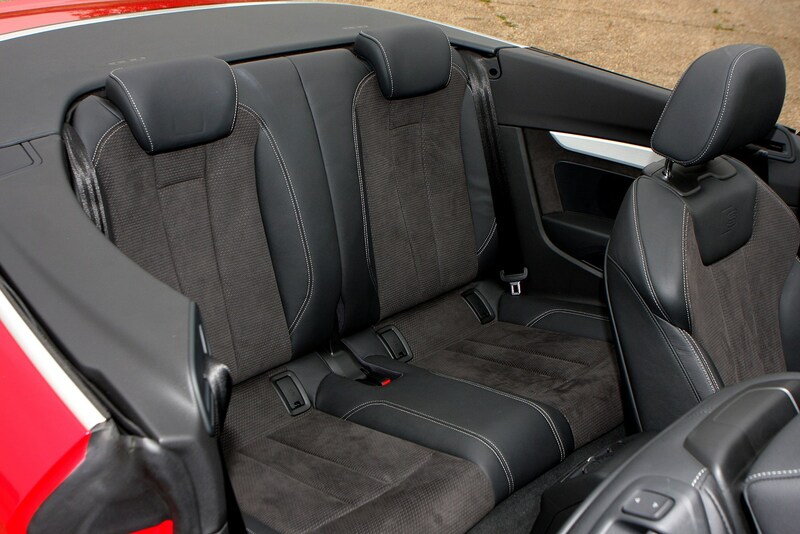 Inside the car there’s a welcome extra inch of shoulder room between front occupants, but the rear seats are only really suitable for smaller people if six-foot-tall adults are up front. 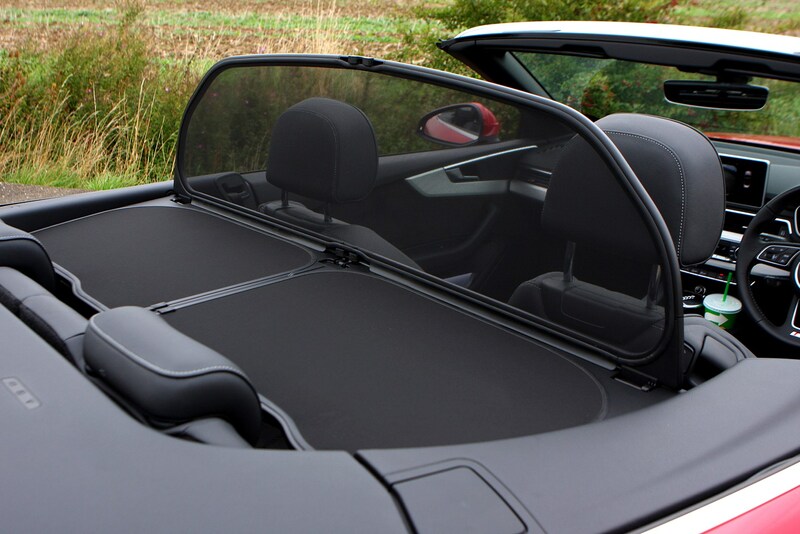 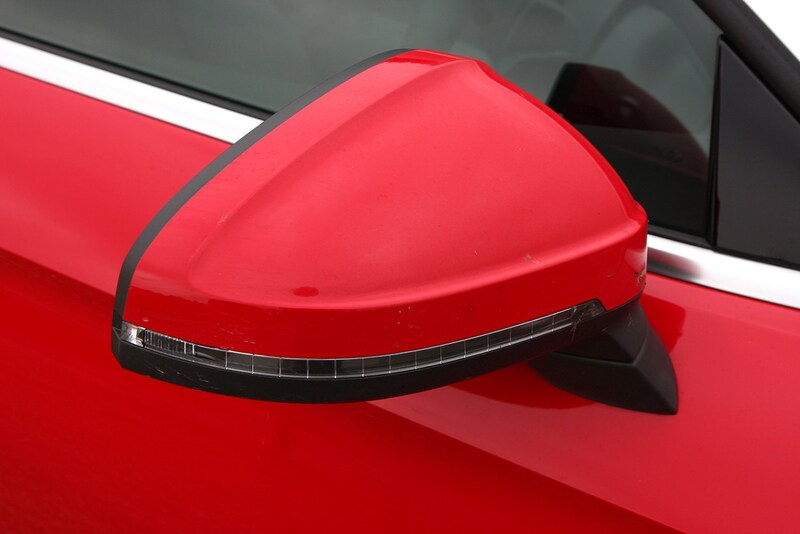 They’re also completely redundant if you use the wind deflector, which is a must if you’re travelling at any sort of speed with the roof down, to keep wind buffeting to a minimum. 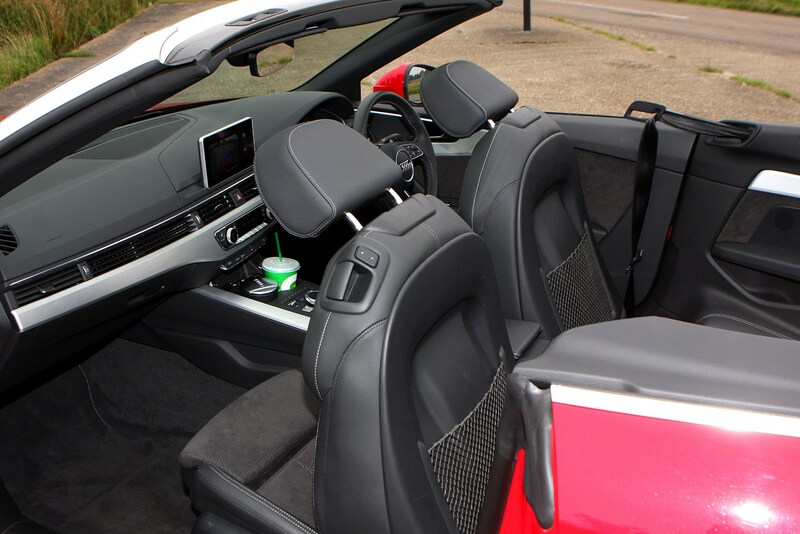 We found headroom impressive with the roof in place too – this isn’t a cramped car in any way unless you’re resigned to sitting in the back for longer periods of time, though it can be quite dark. 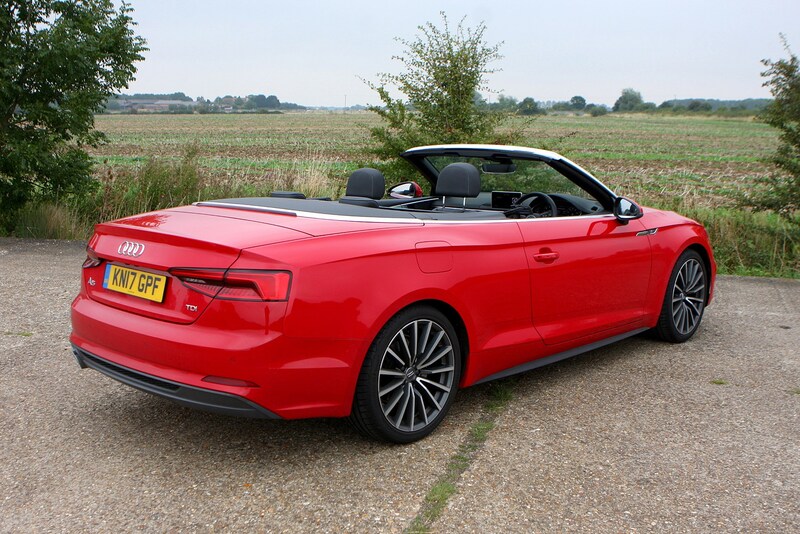 However, it’s not too bad at all. 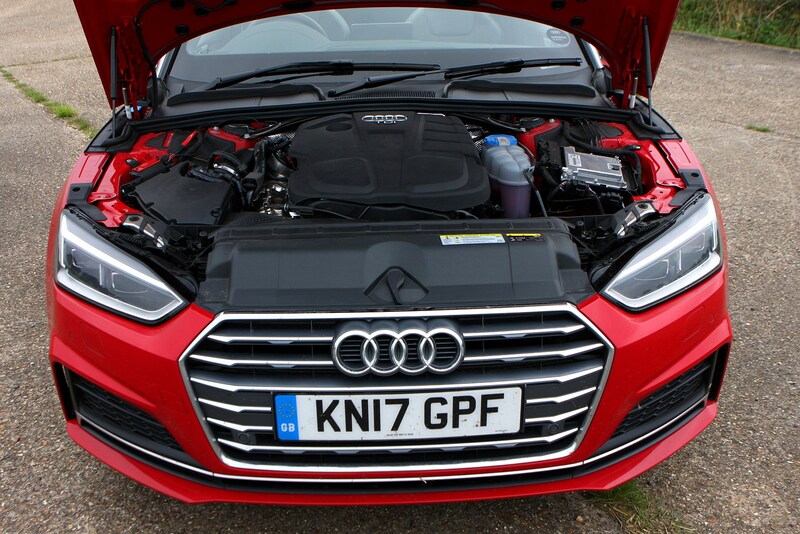 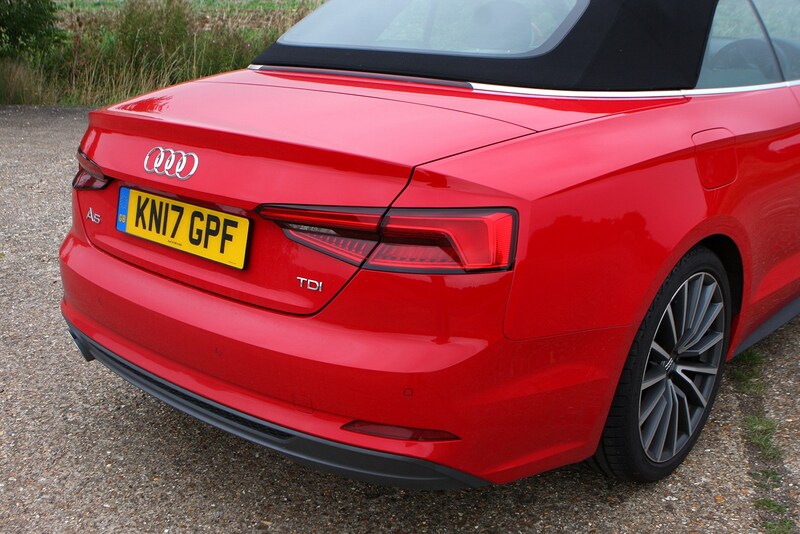 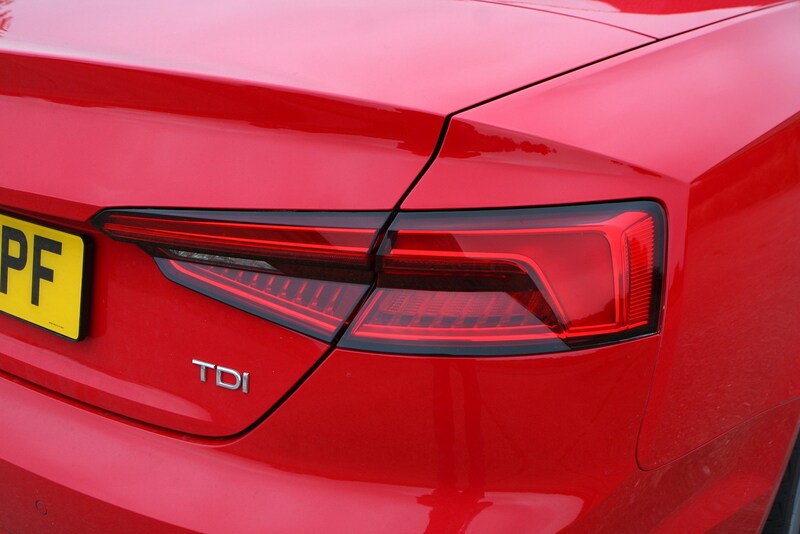 The A5 isn’t a daunting car to drive or manoeuvre, although rear visibility is a little more restricted than the Coupe due to the fabric roof and smaller rear windows. 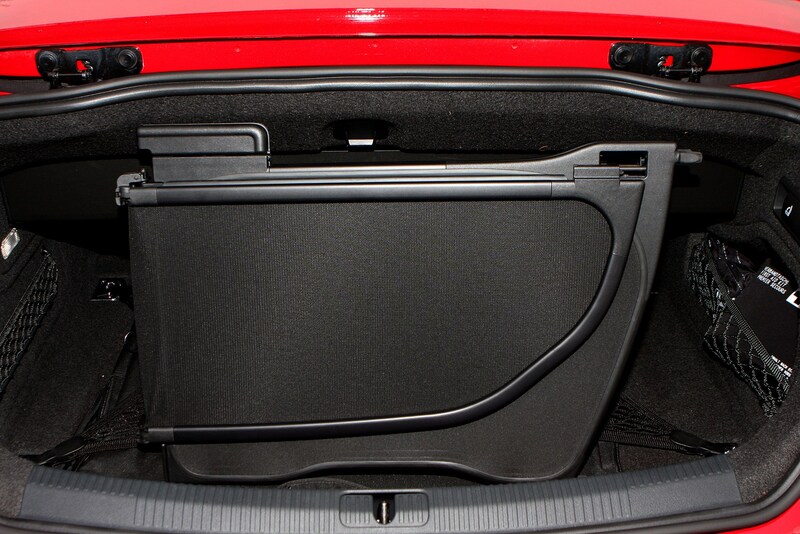 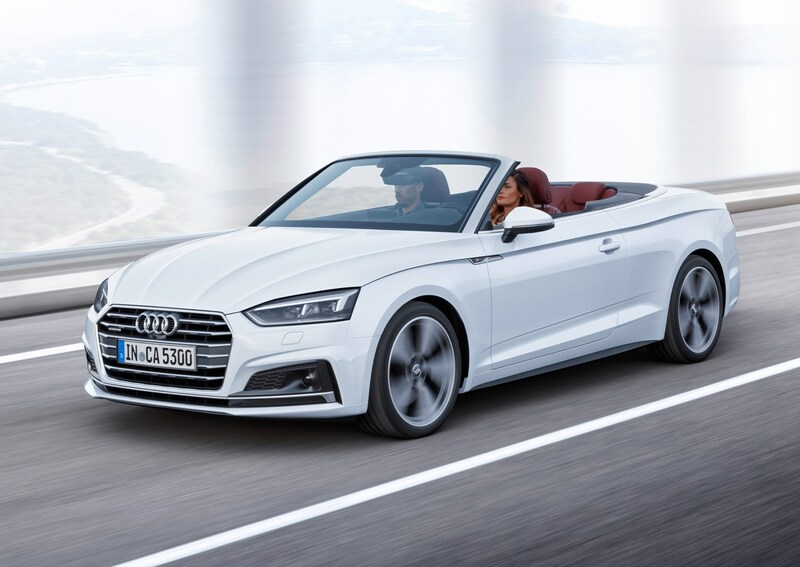 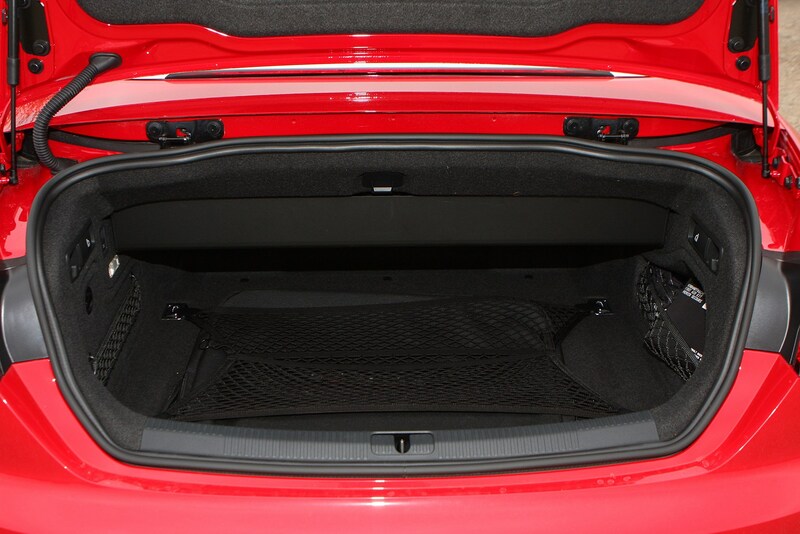 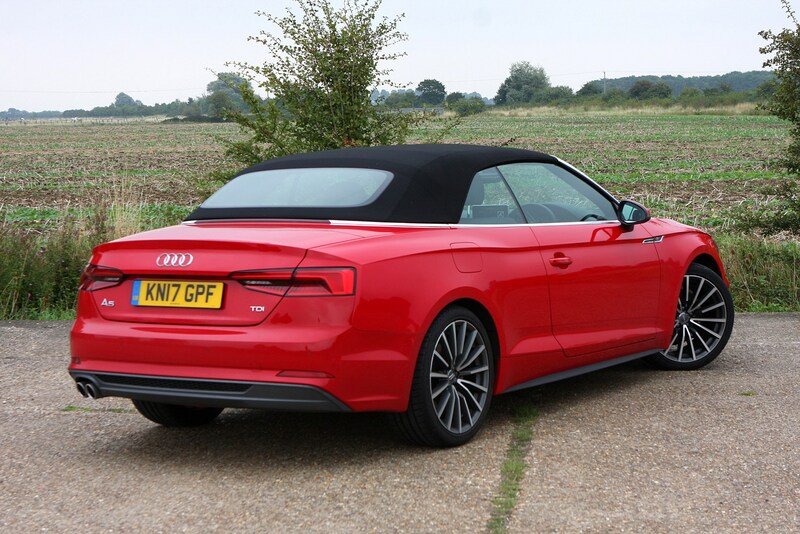 Total boot capacity is 380 litres, while the rear seats split in three and fold forward using levers in the boot to allow longer items to be stowed – however this isn’t available on the S5 Cabriolet. 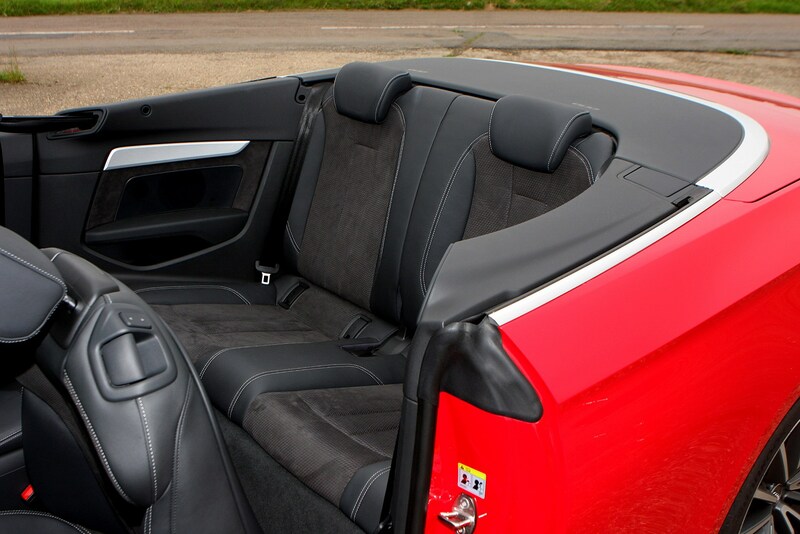 If you want the roof down you’ll have to sacrifice 60 litres of boot room, but handily there’s a switch in there that allows you to drop the box the roof folds into independently, so you can work out whether your cases will fit in any situation before you set off without operating the entire soft-top mechanism. 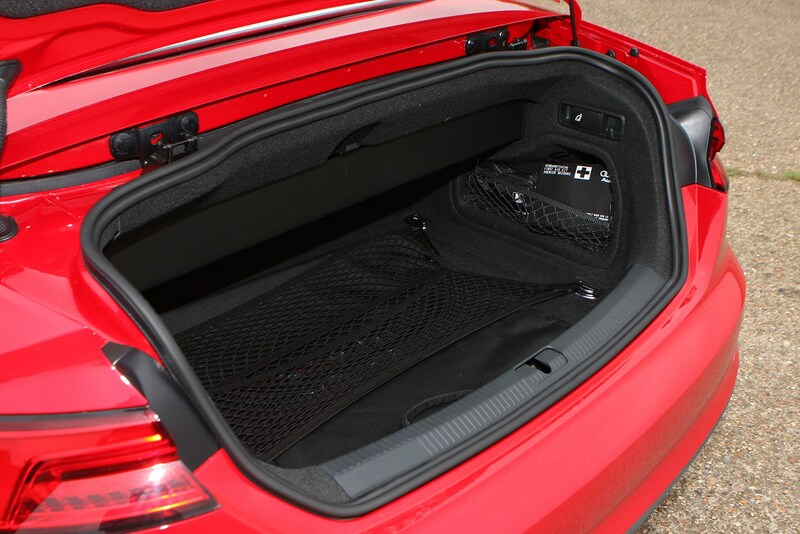 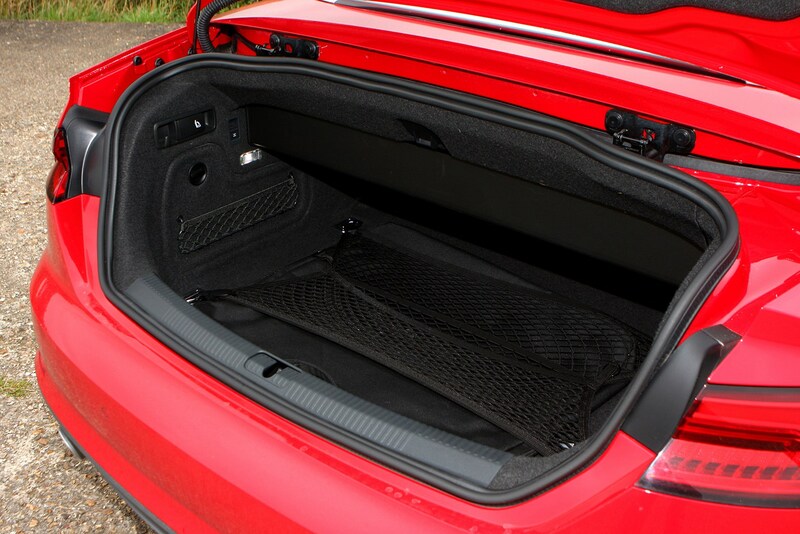 Check the table below to see how the Audi A5 Cabriolet compares to other similar cars in terms of available boot space.